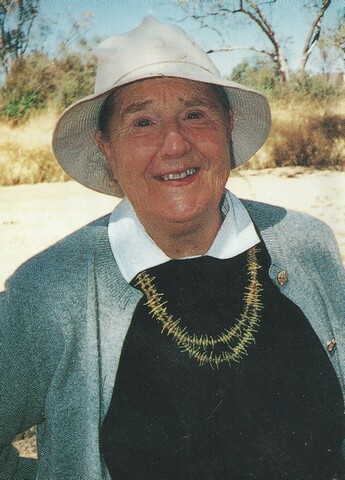 Welcome to Helen Baldwin's Website. 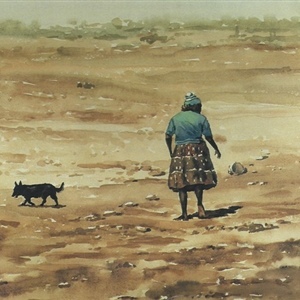 Please take the time to browse the Gallery of her works or even take some time to read her short stories under publications. 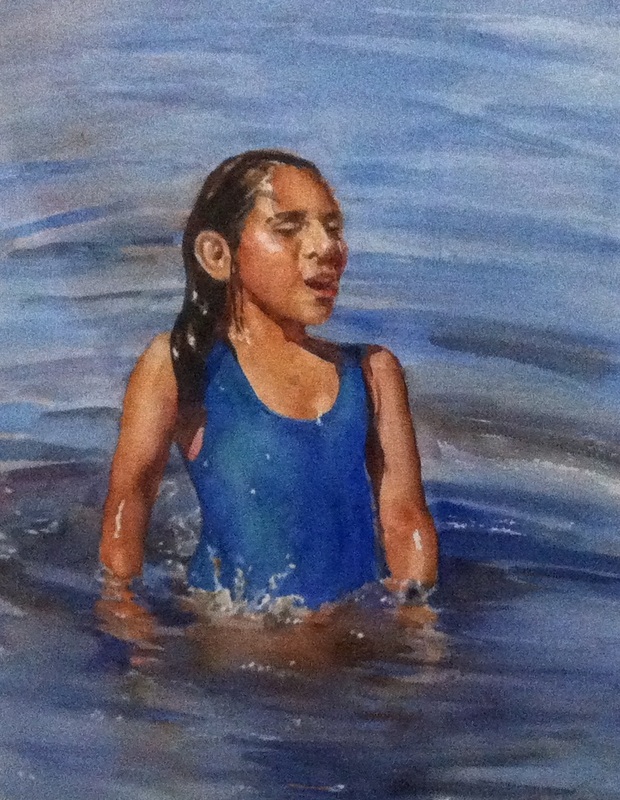 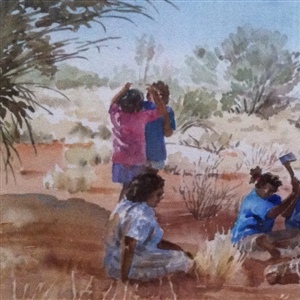 Helen paints with great technical skill and with a fresh and honest style that has produced not only a major body of work but also an anthropological record of great value. 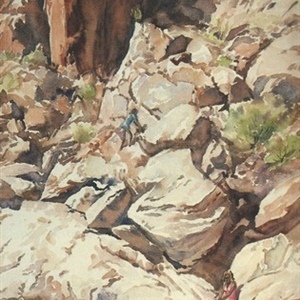 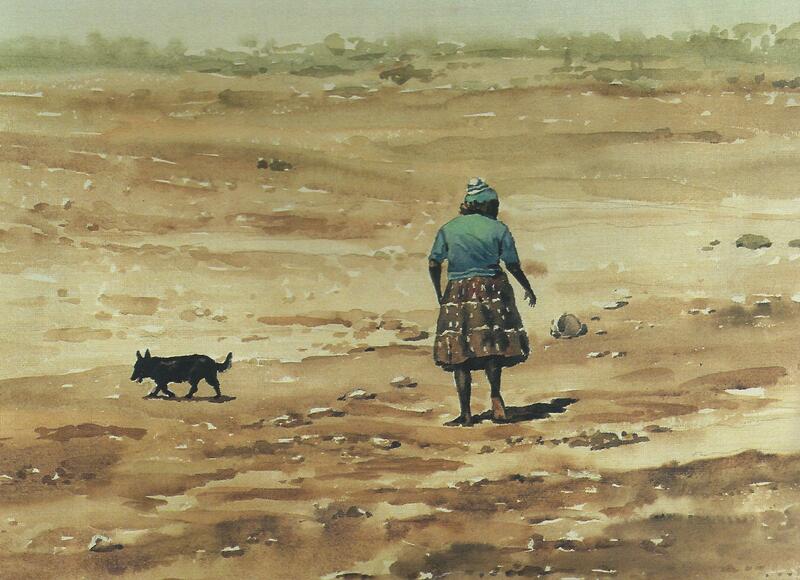 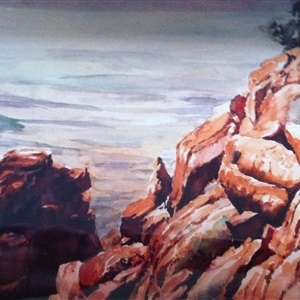 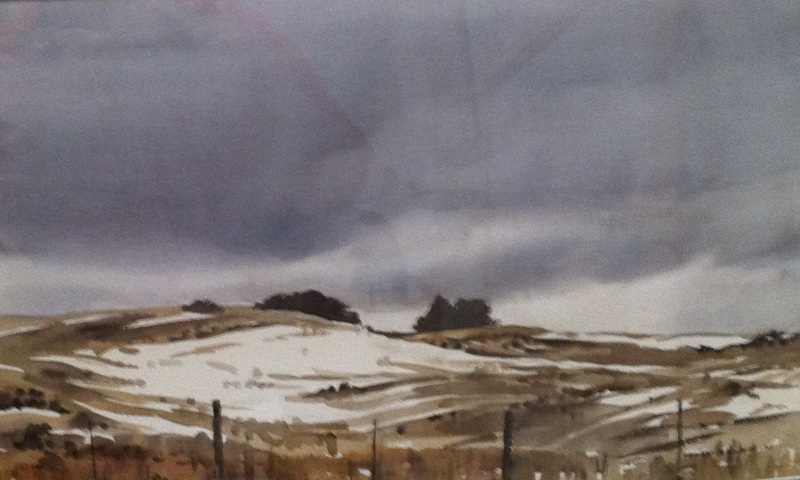 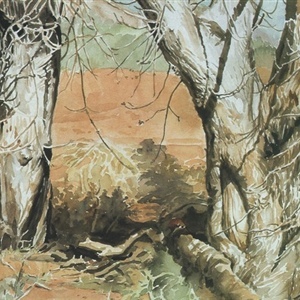 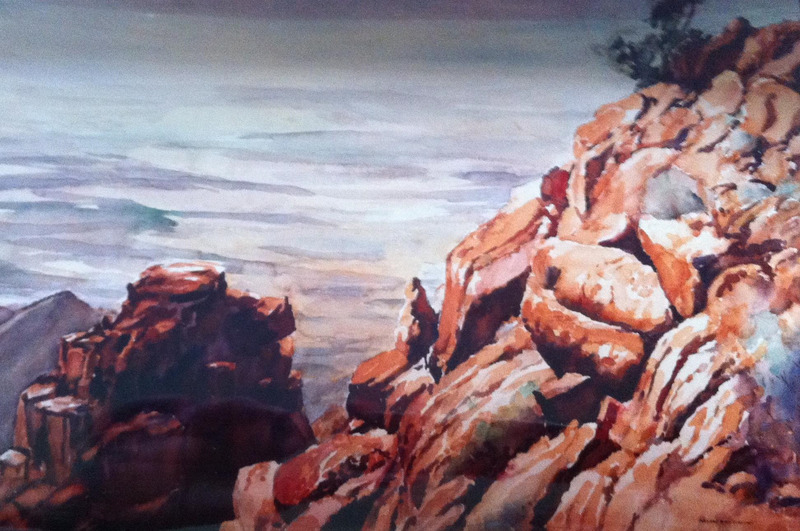 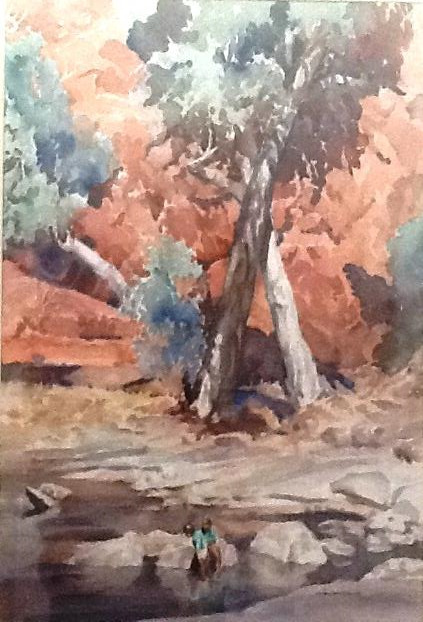 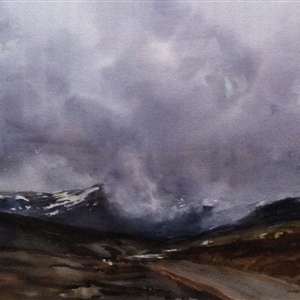 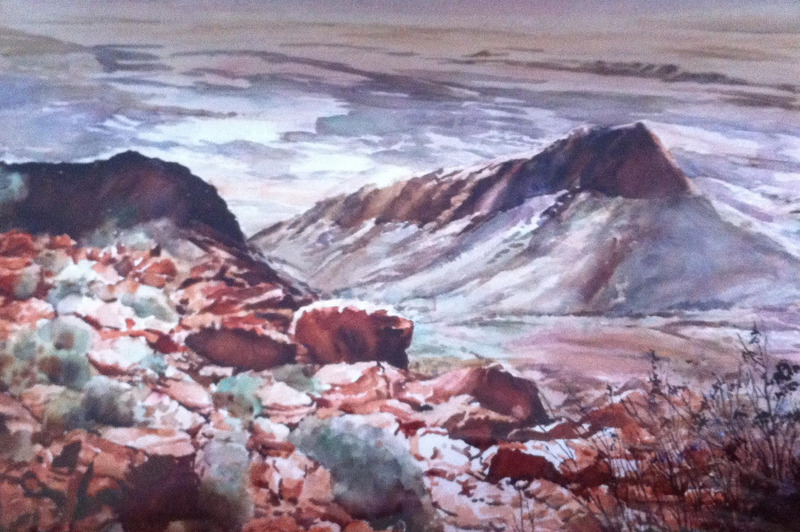 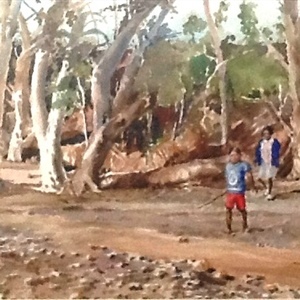 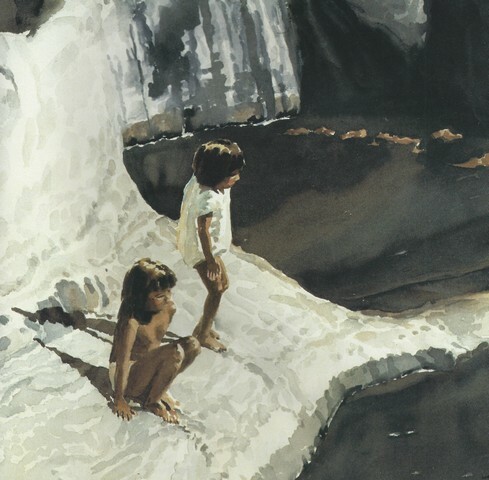 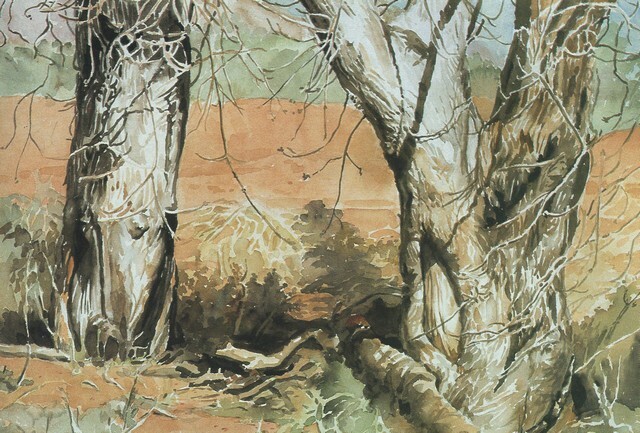 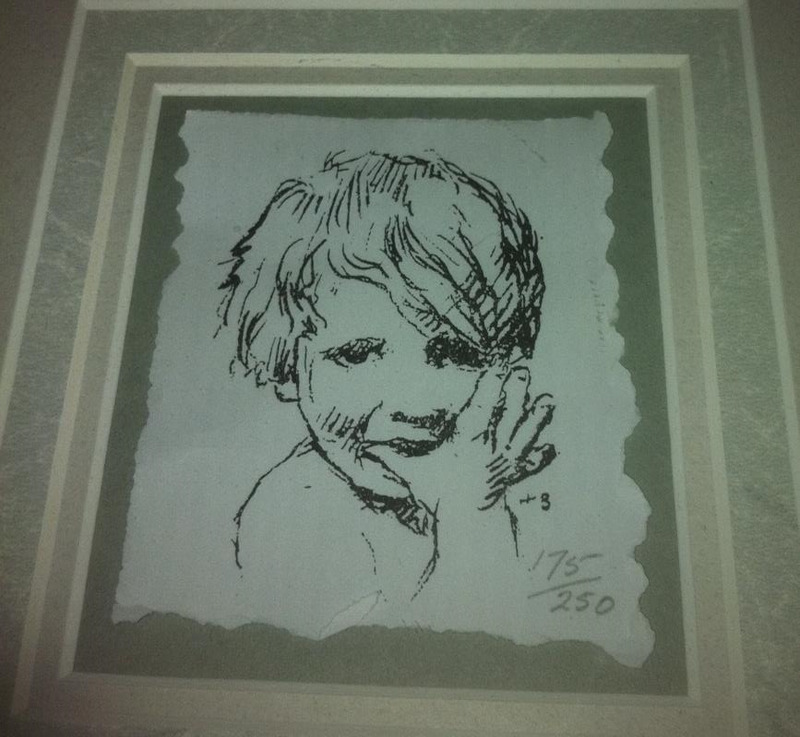 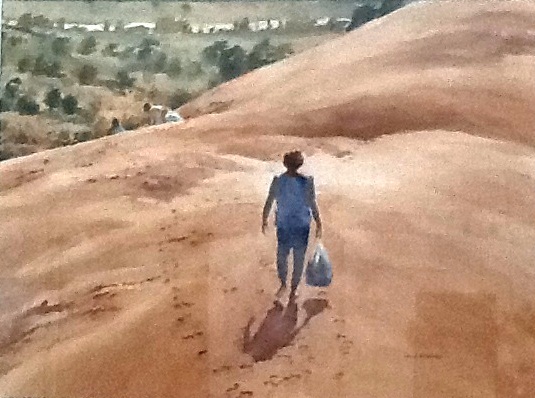 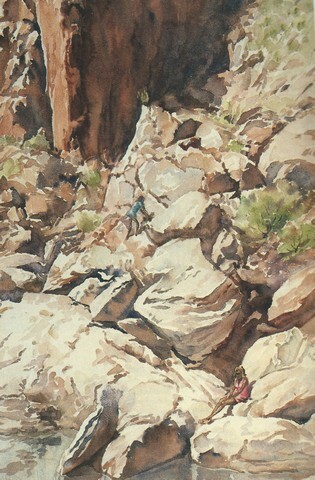 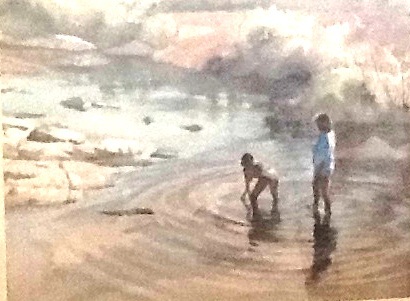 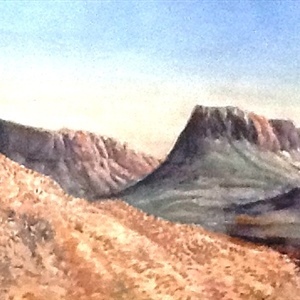 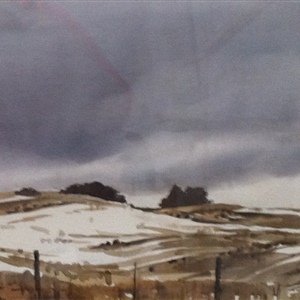 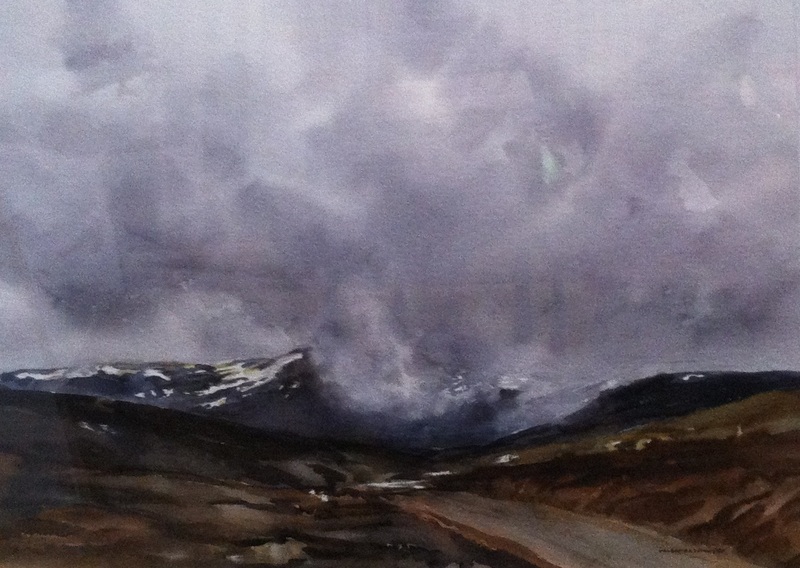 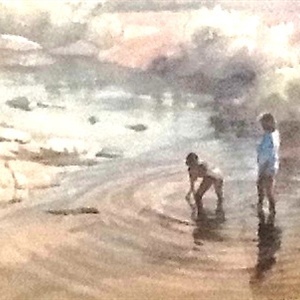 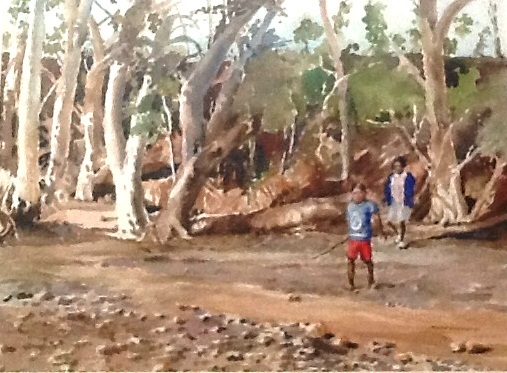 Helen has included figures in her landscapes, so much in harmony with the worked around them. 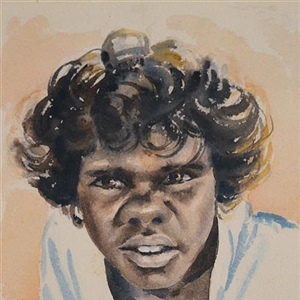 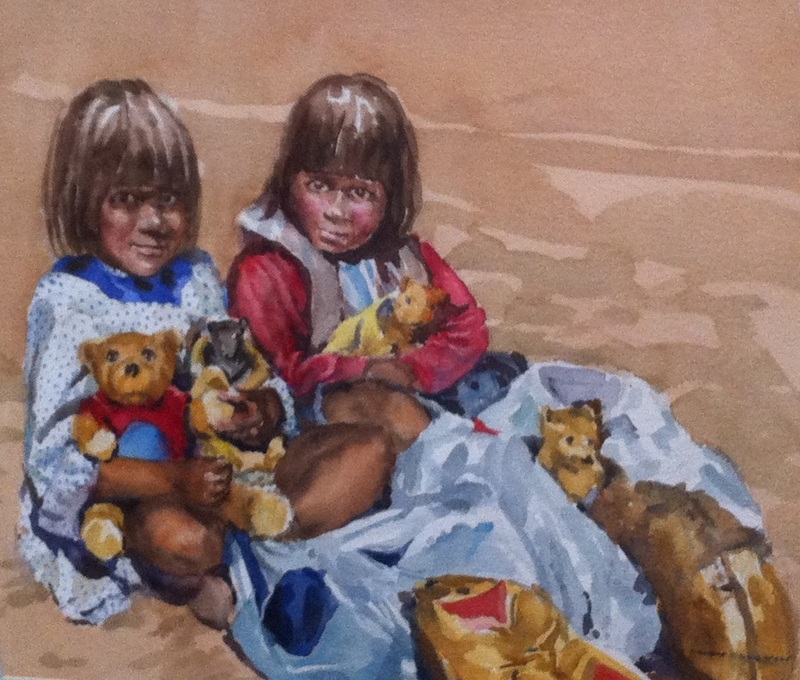 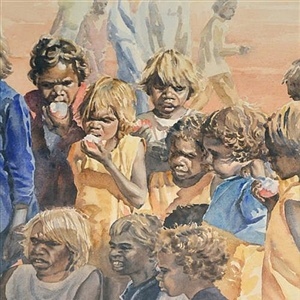 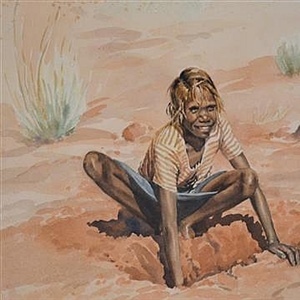 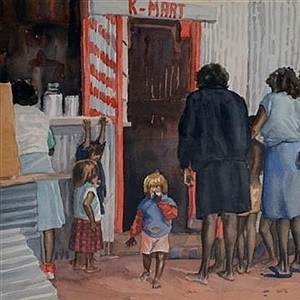 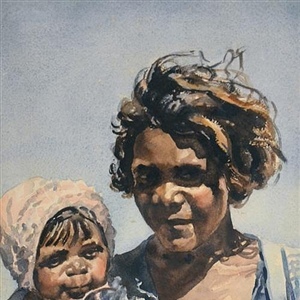 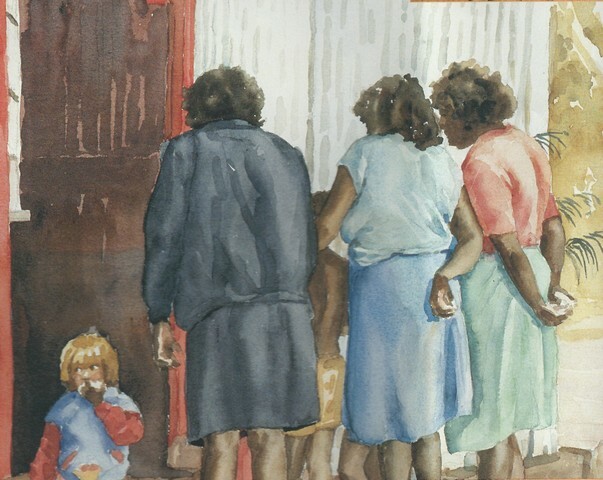 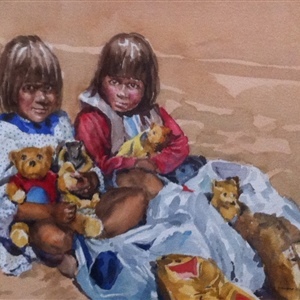 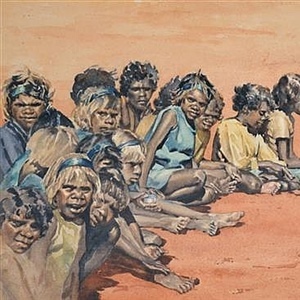 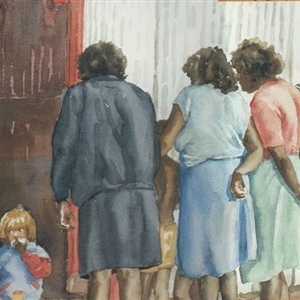 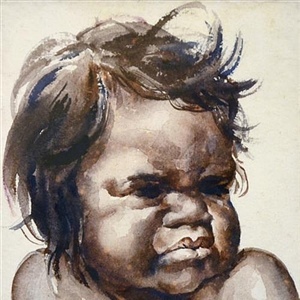 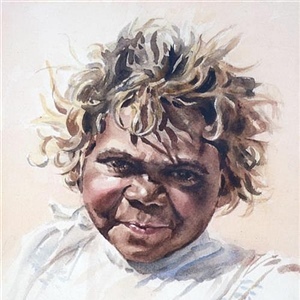 In her long passion to convey her vision to canvas, she has mirrored the changes that have occurred in aboriginal society, changes which over the last fifty years have been profound. 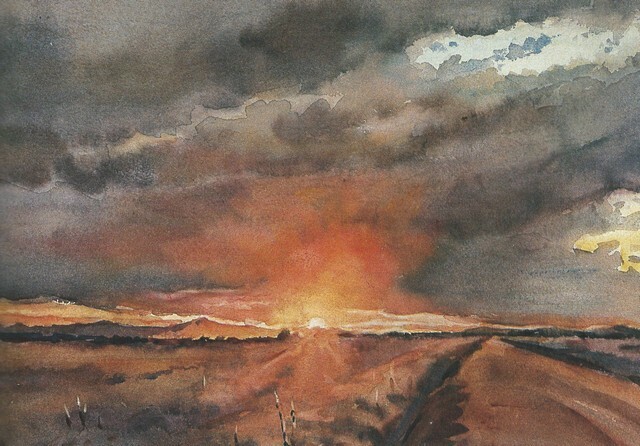 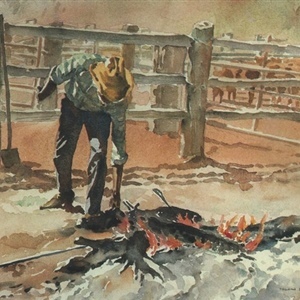 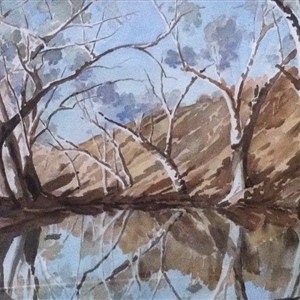 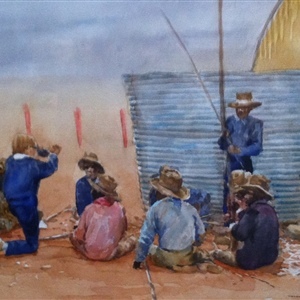 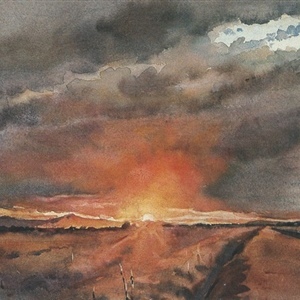 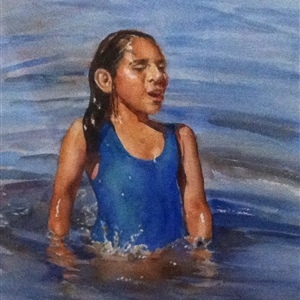 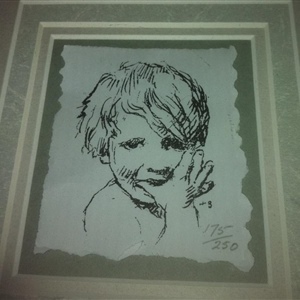 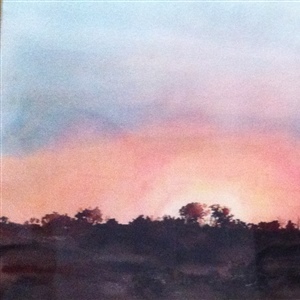 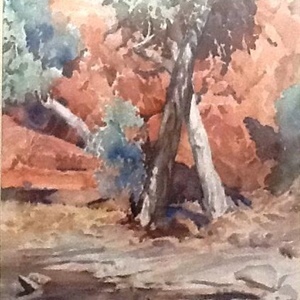 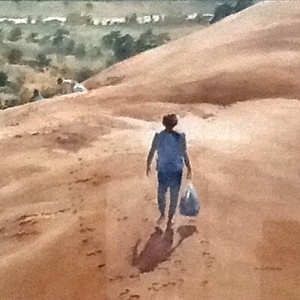 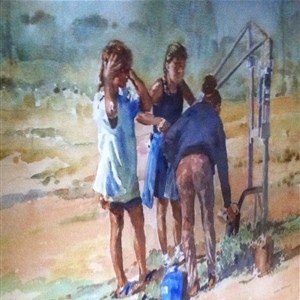 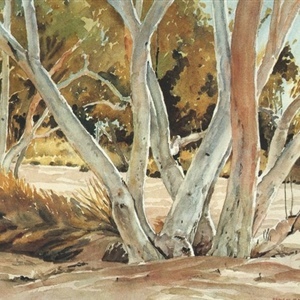 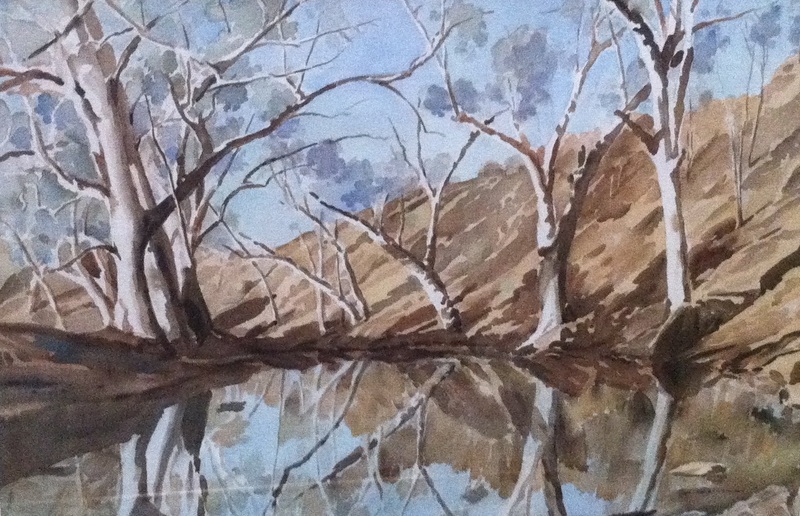 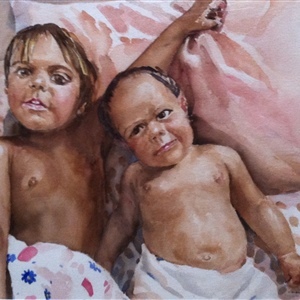 Helen has traveled and painted in western New South Wales, the Northern Territory, Queensland and South and Western Australia. 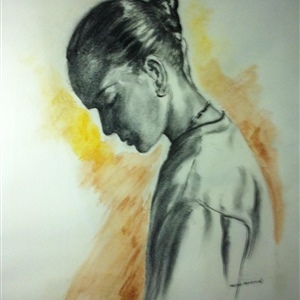 It is always the harsh and dry centre that attracted her. 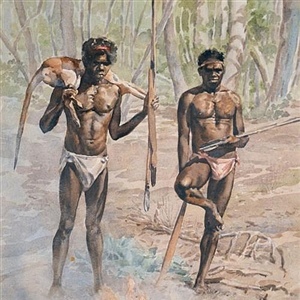 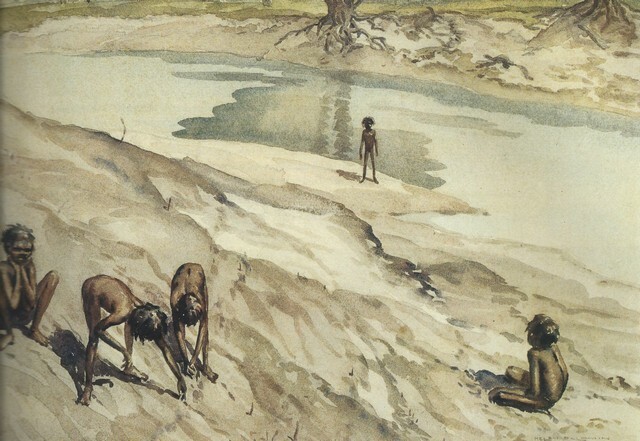 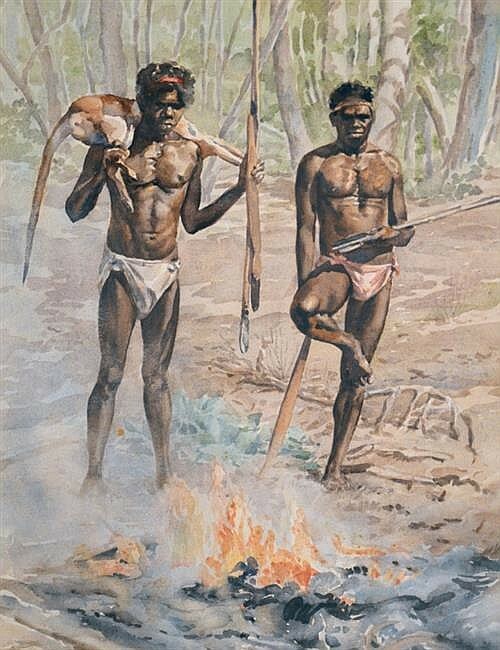 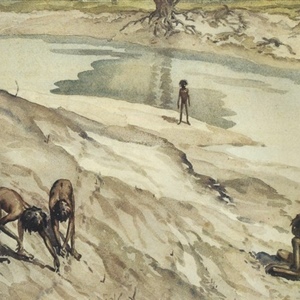 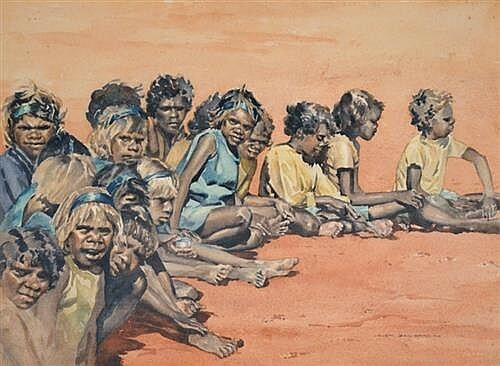 It has also been where the last remnants of aboriginal tribal life have survived longest. 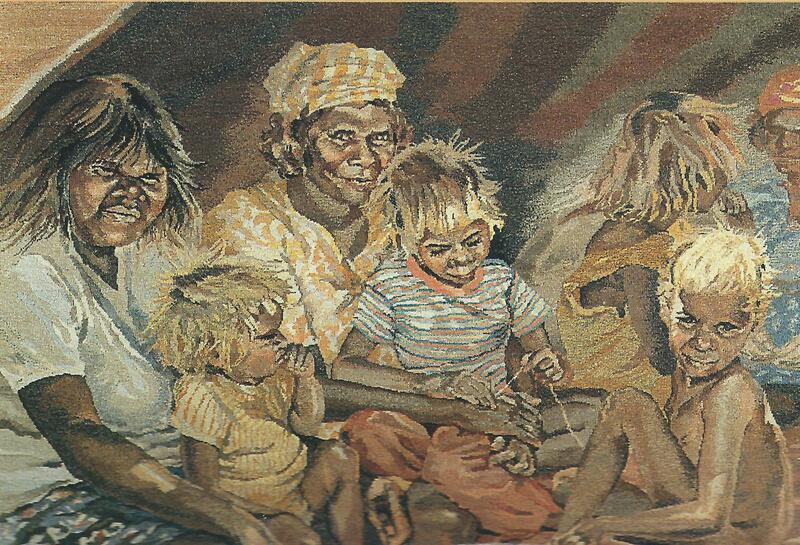 Now this traditional life is slipping away. 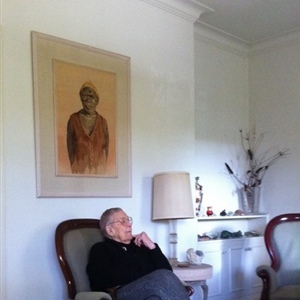 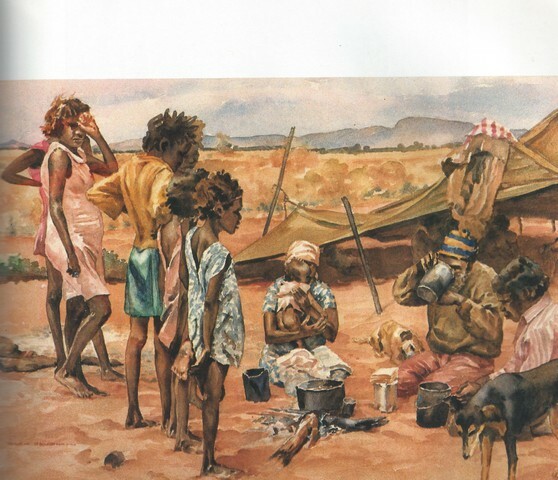 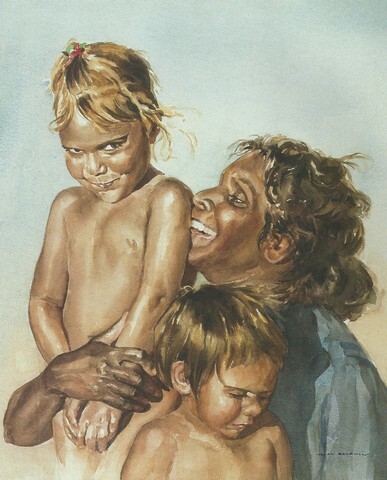 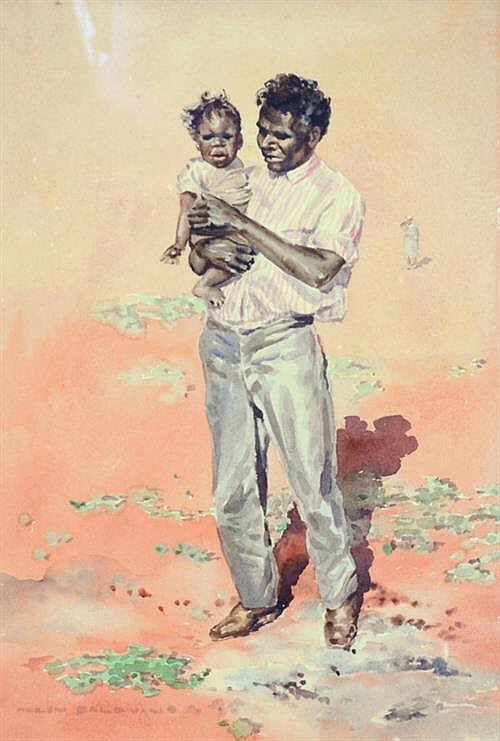 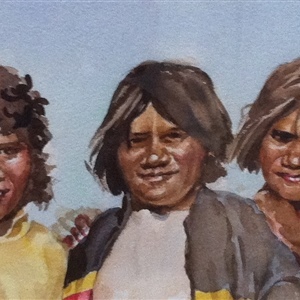 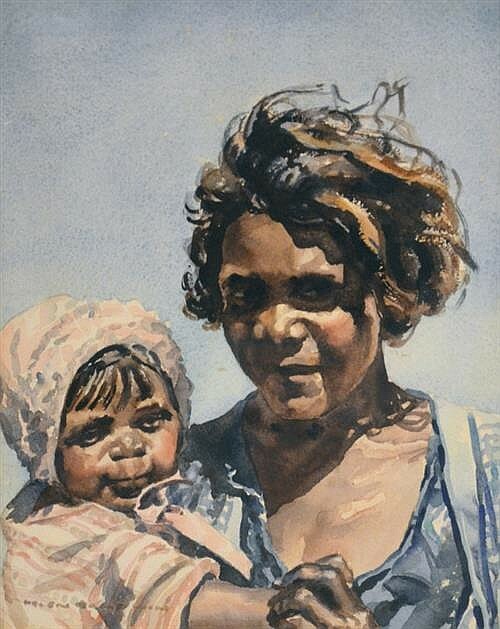 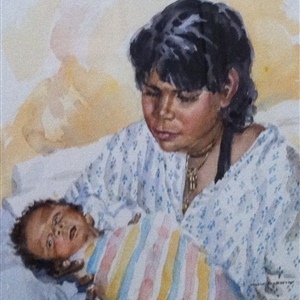 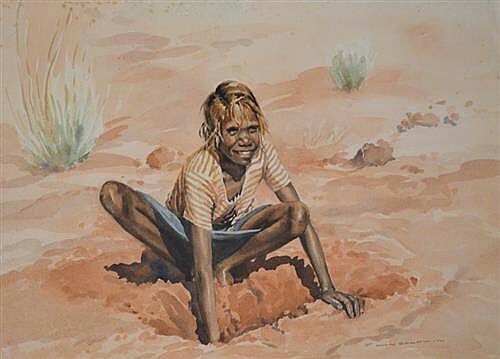 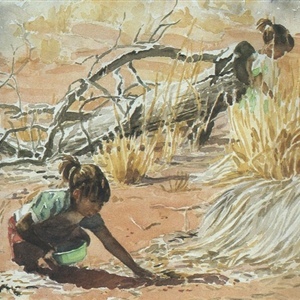 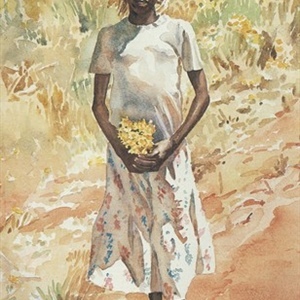 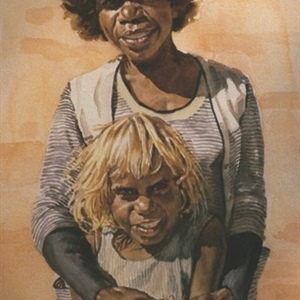 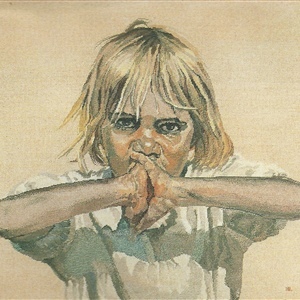 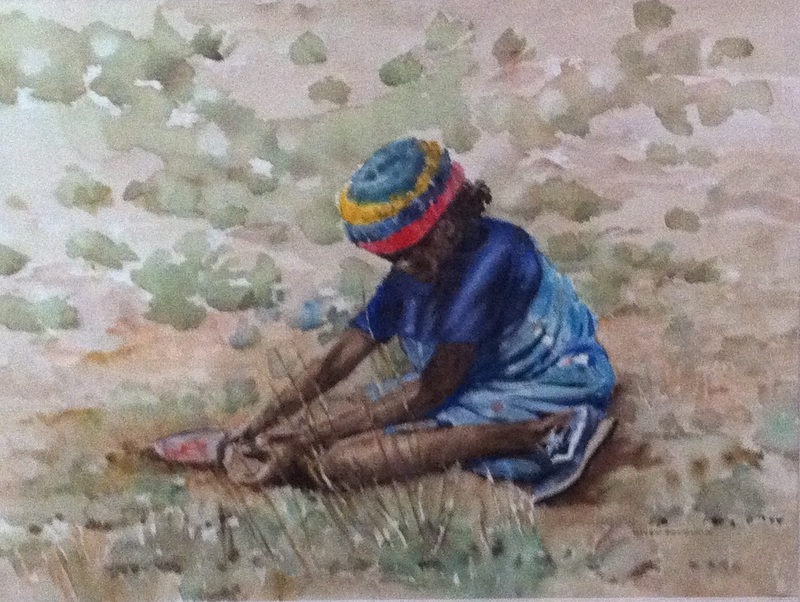 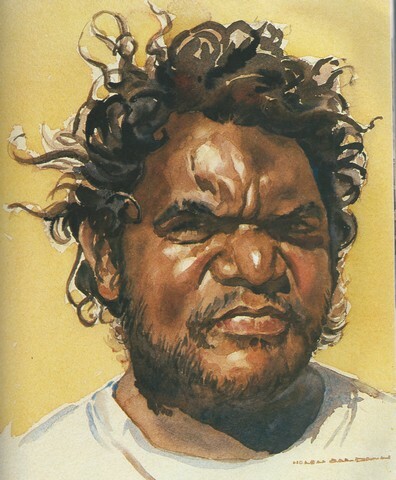 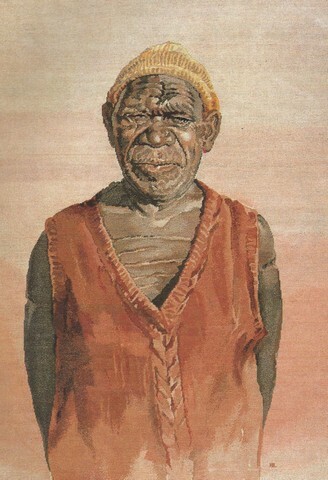 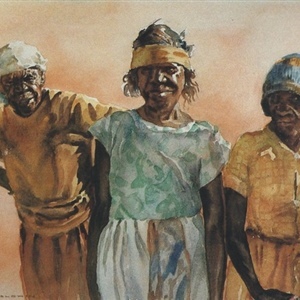 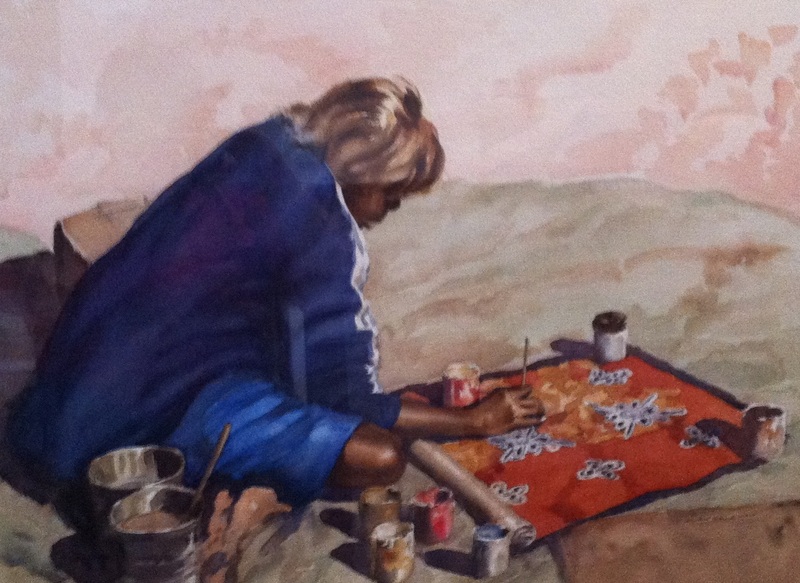 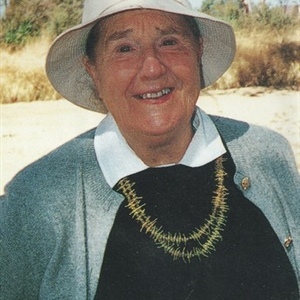 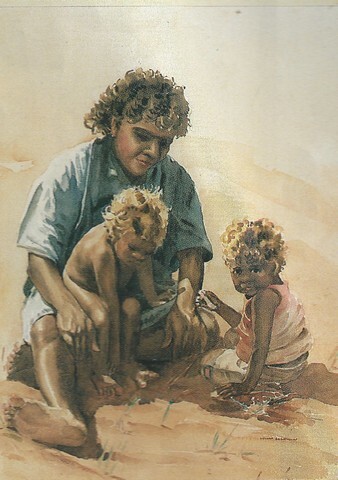 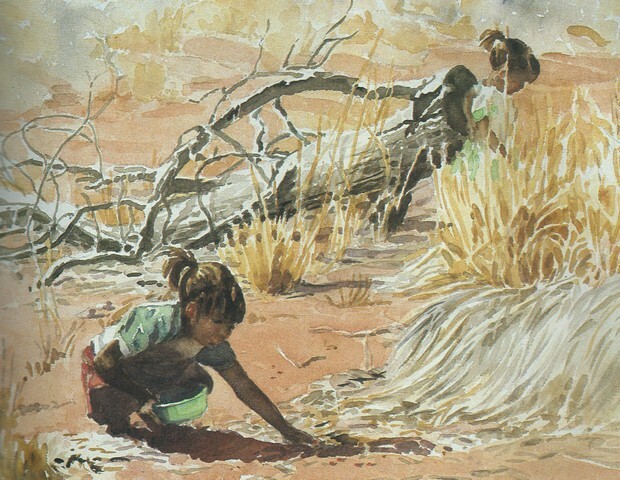 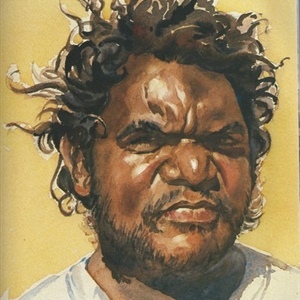 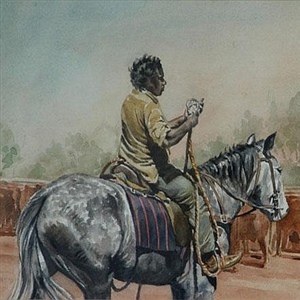 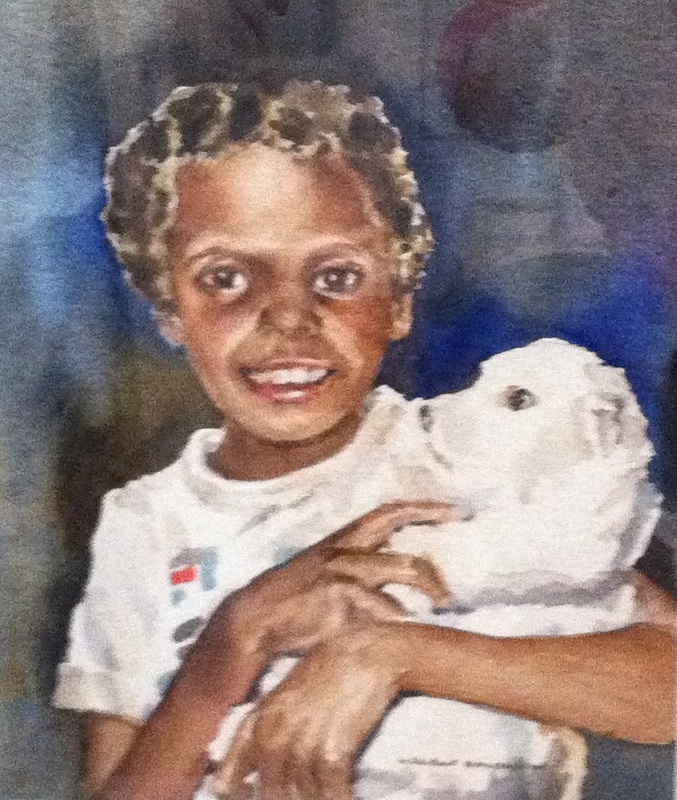 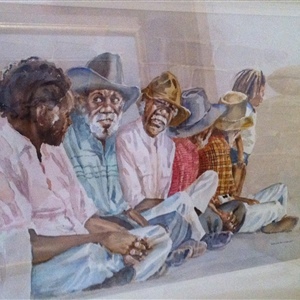 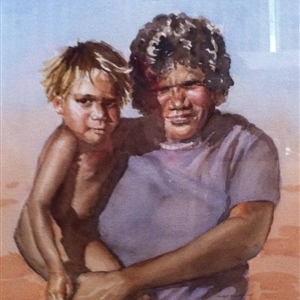 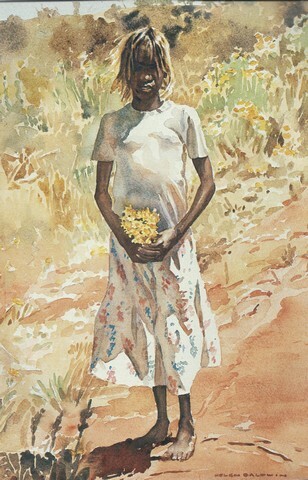 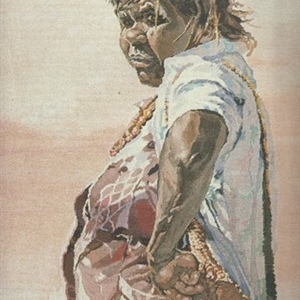 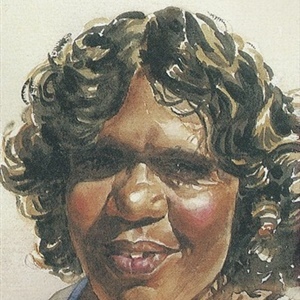 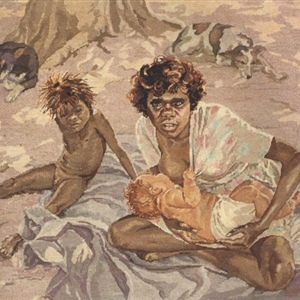 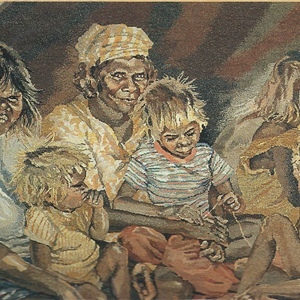 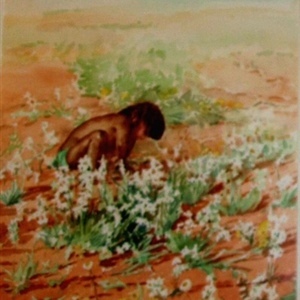 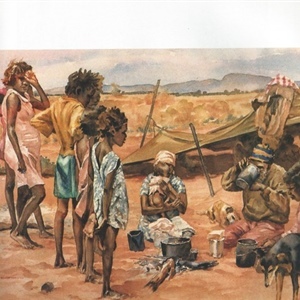 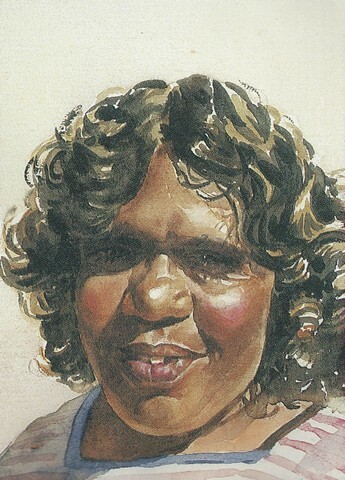 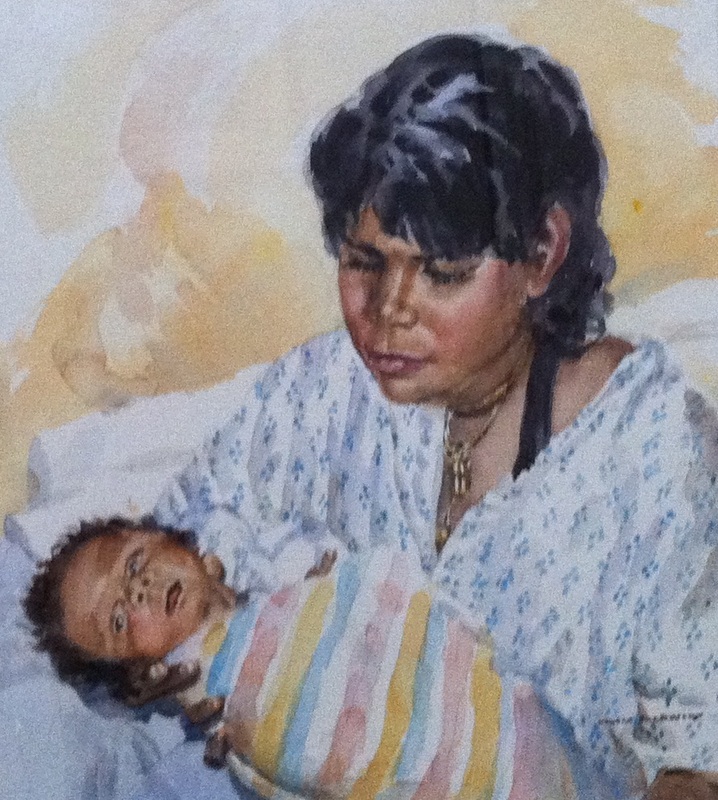 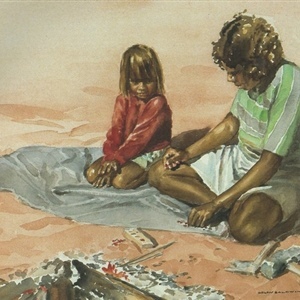 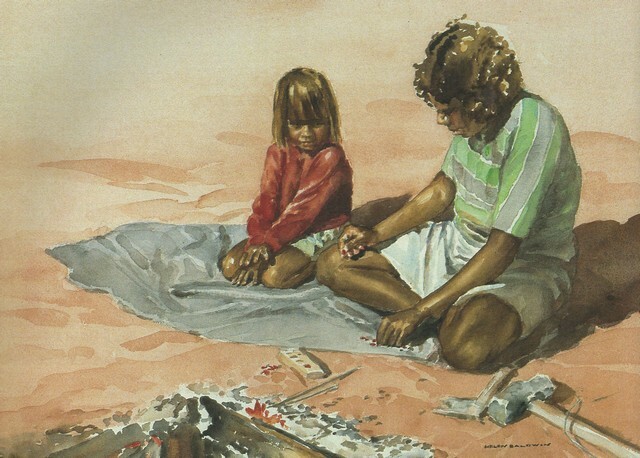 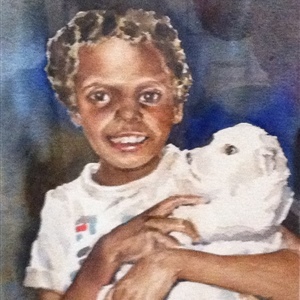 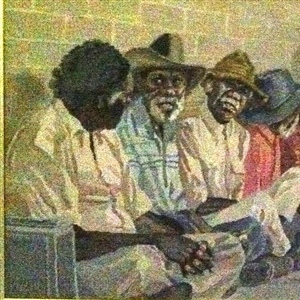 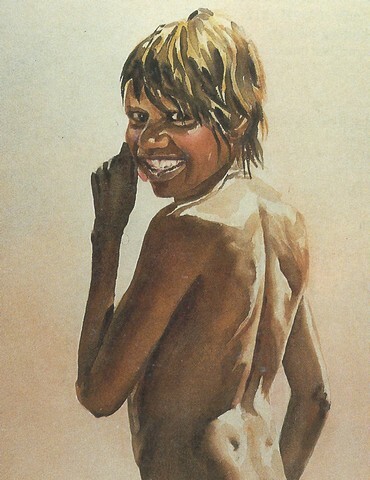 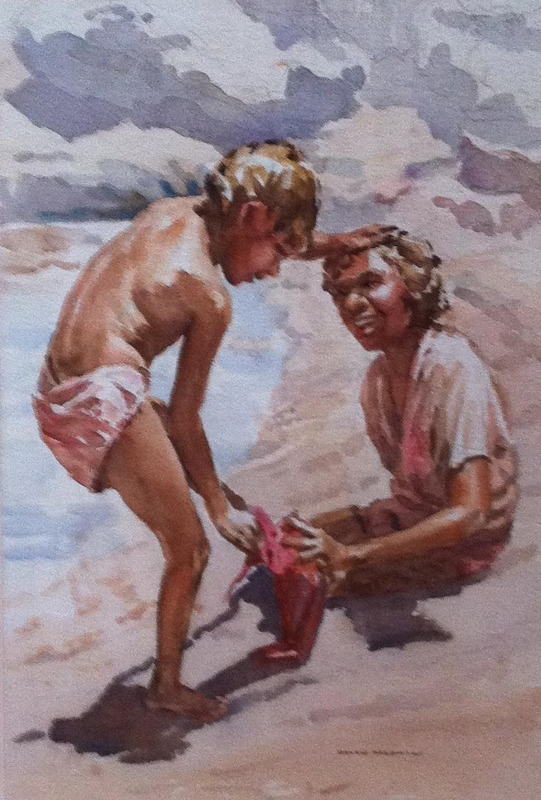 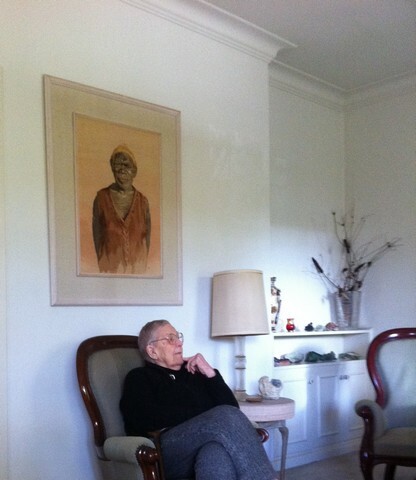 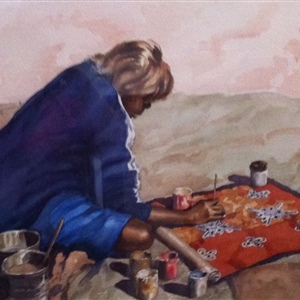 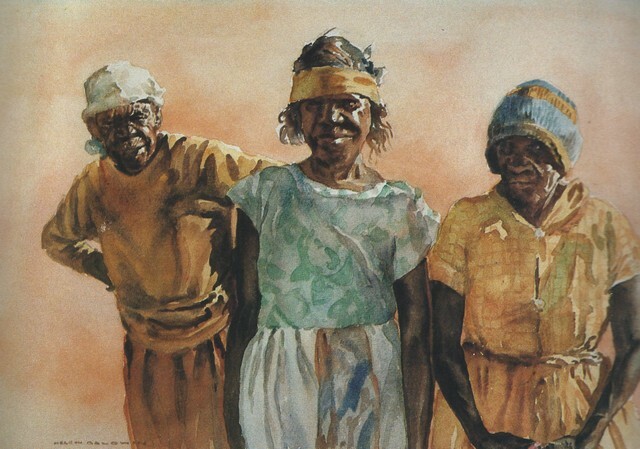 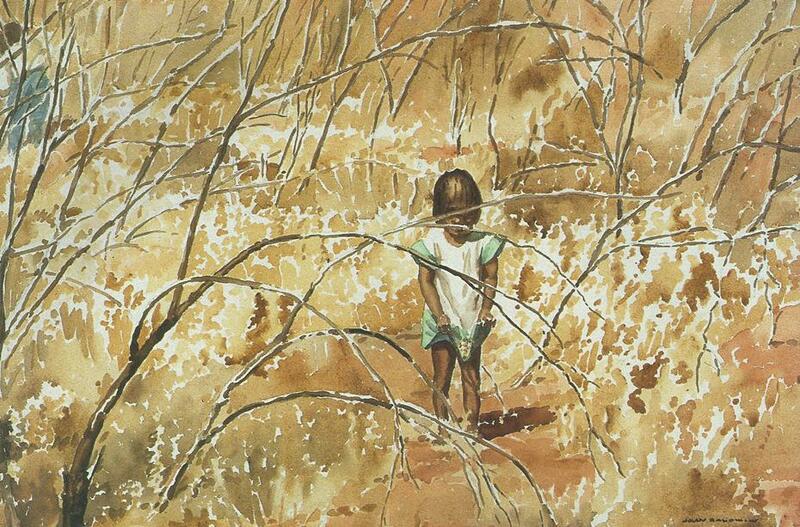 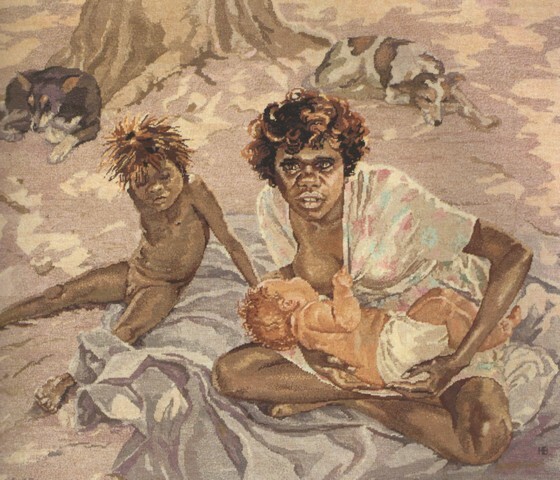 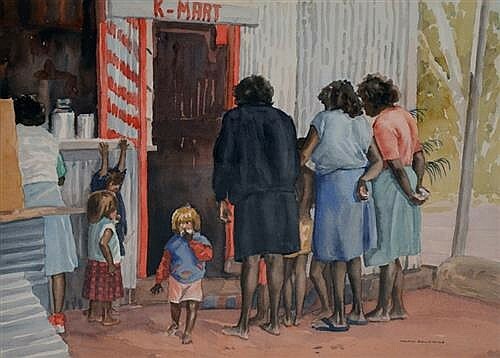 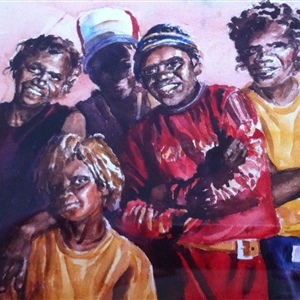 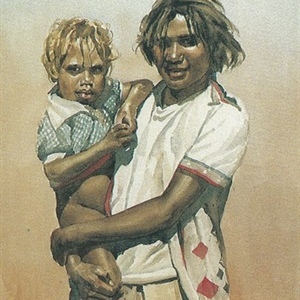 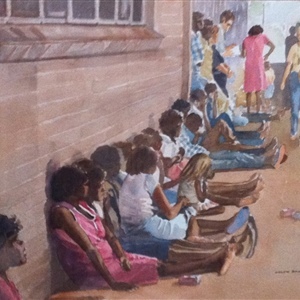 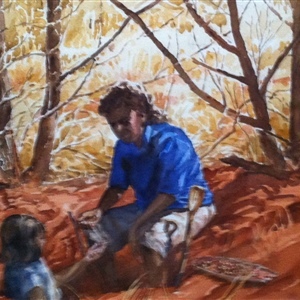 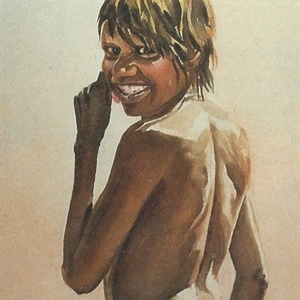 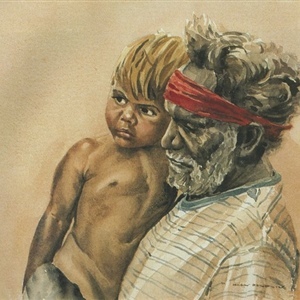 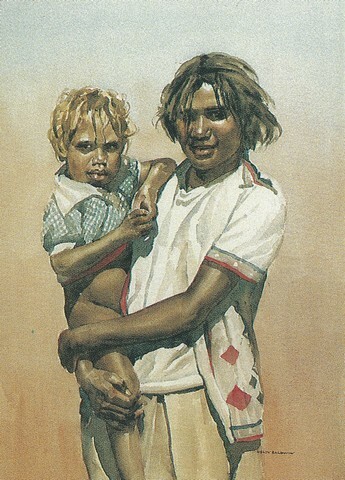 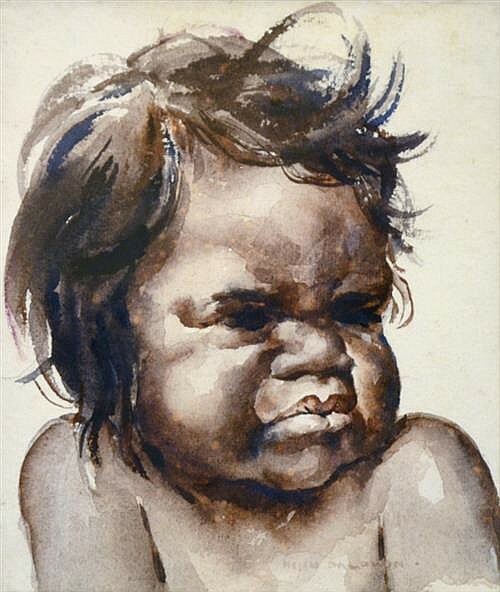 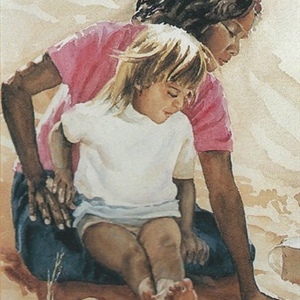 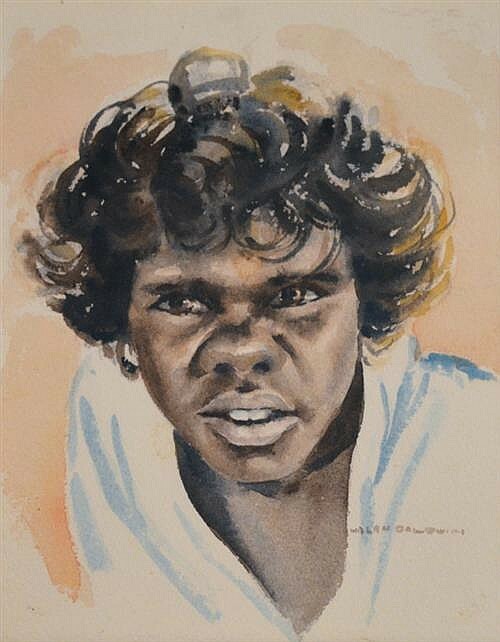 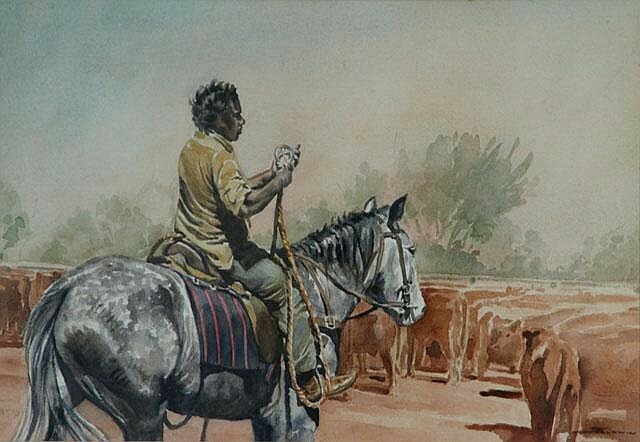 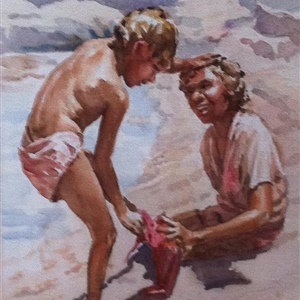 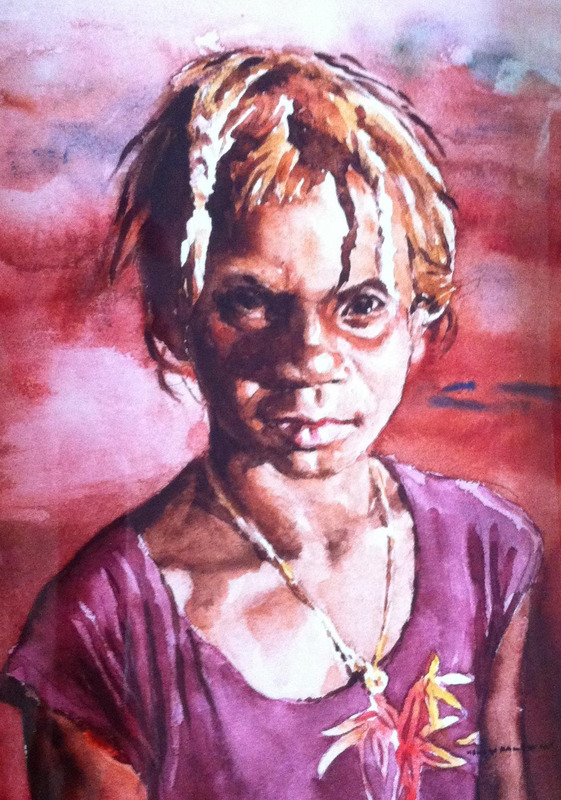 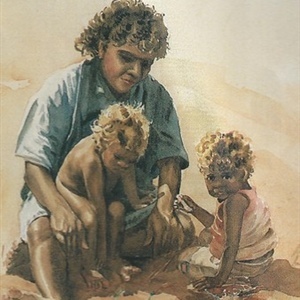 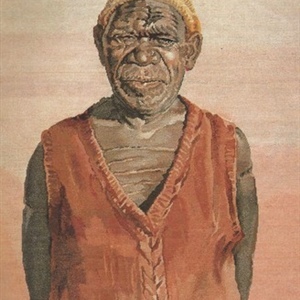 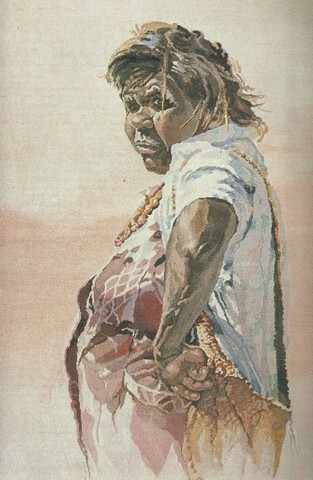 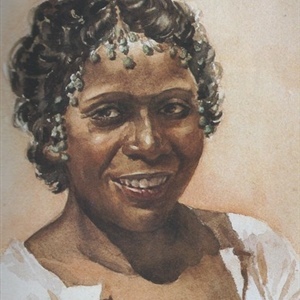 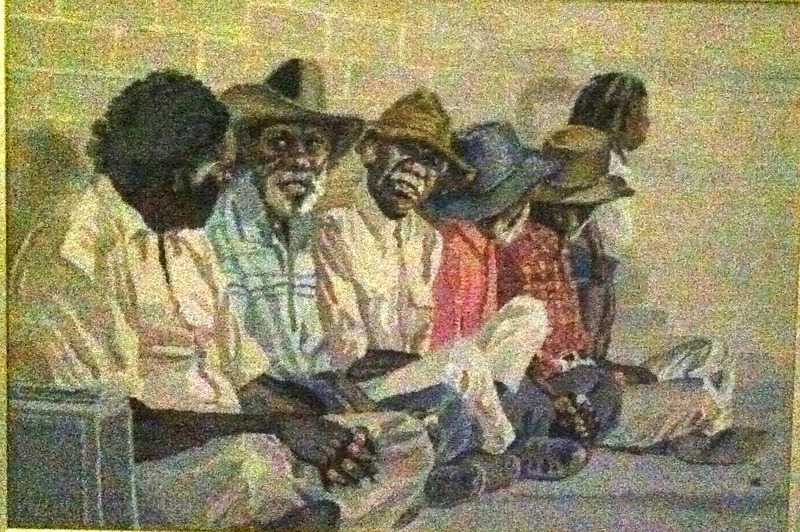 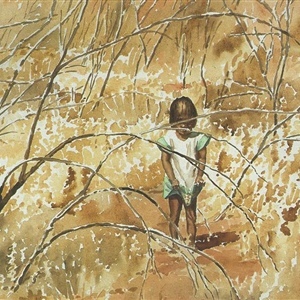 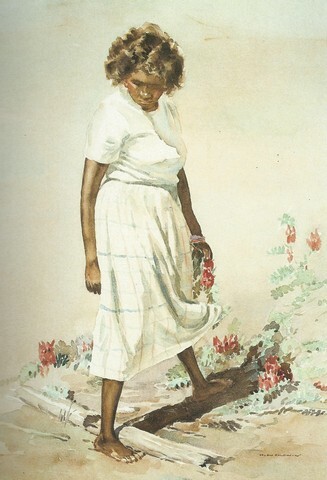 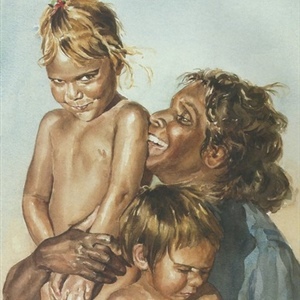 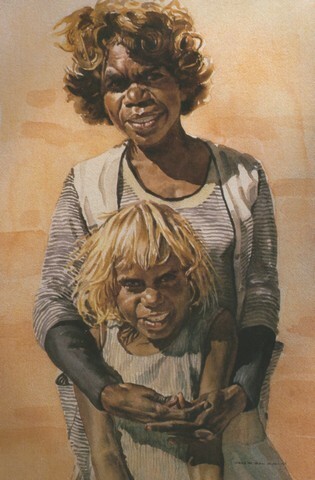 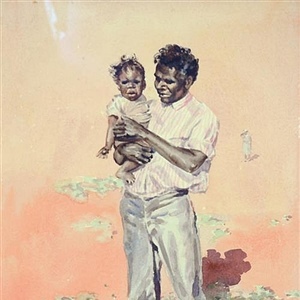 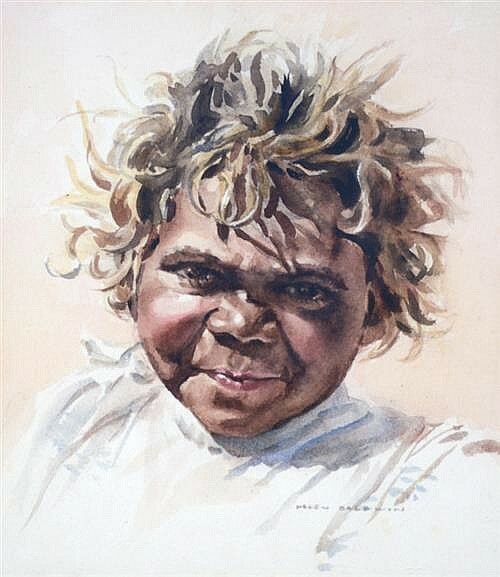 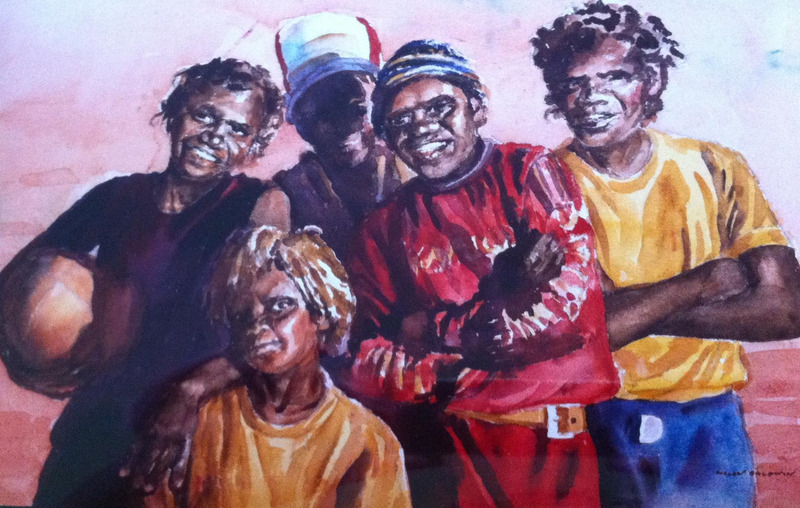 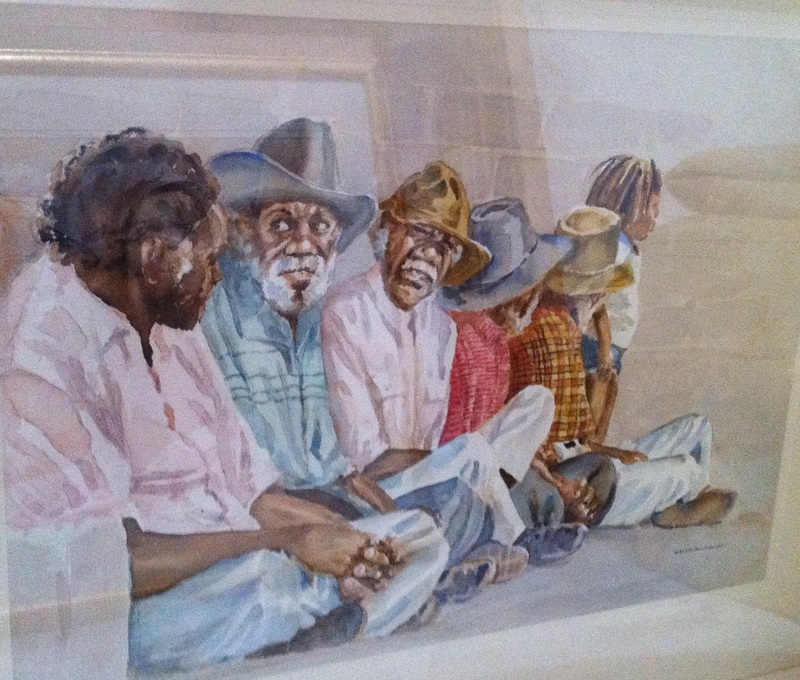 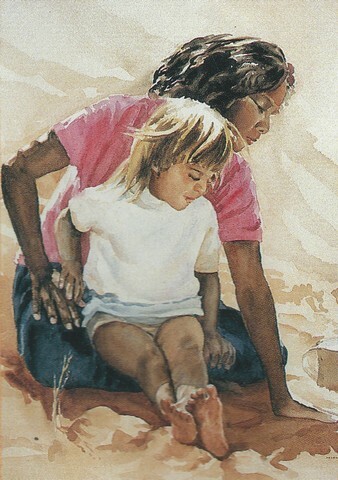 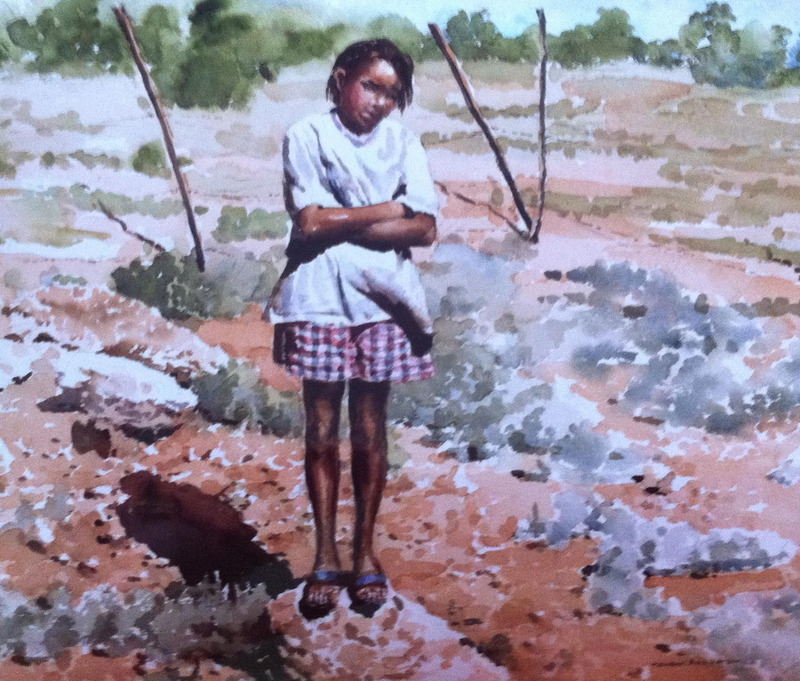 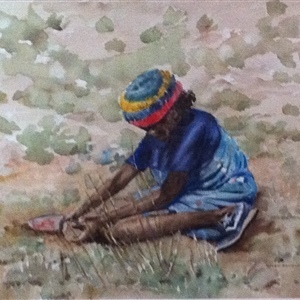 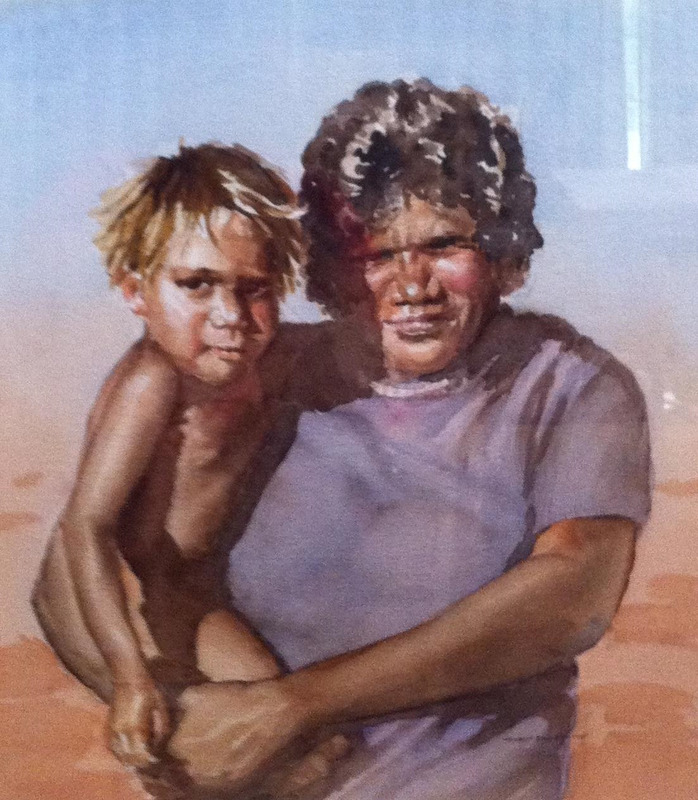 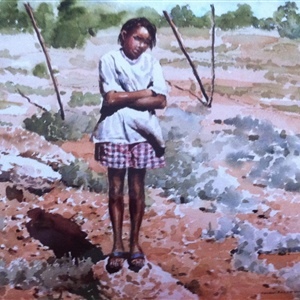 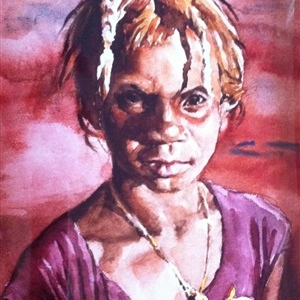 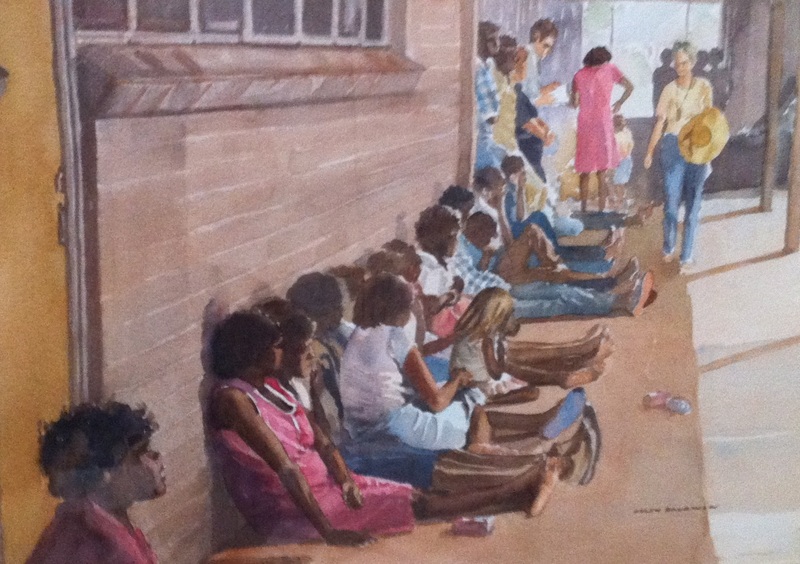 For many years Helen became a regular visitor to Yuendumu. 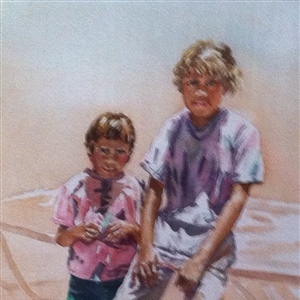 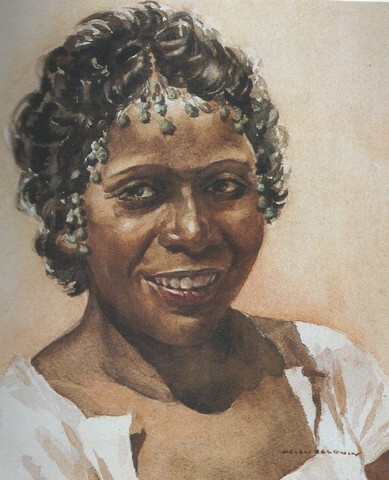 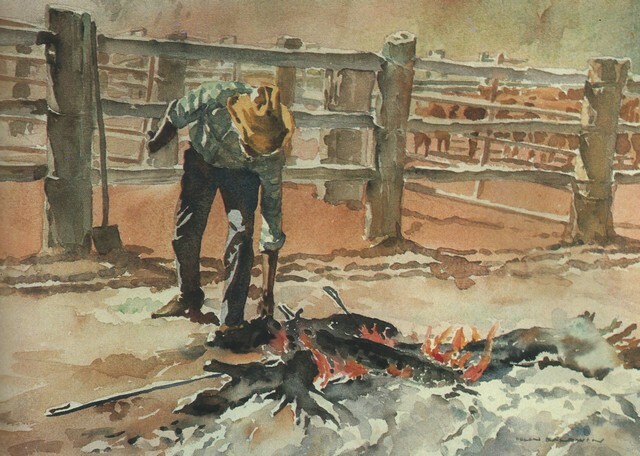 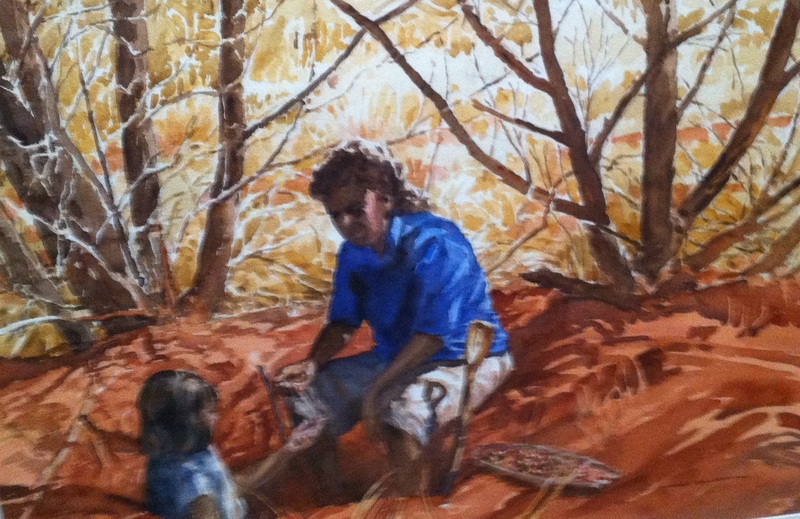 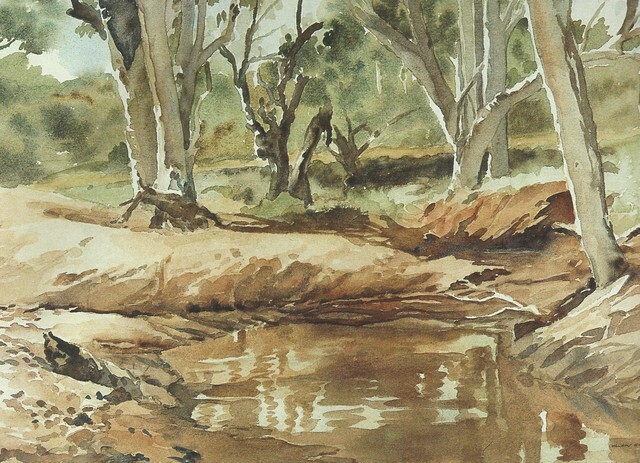 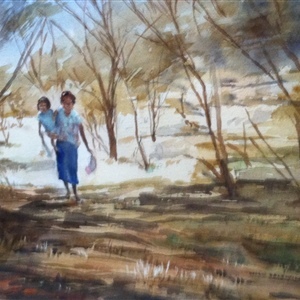 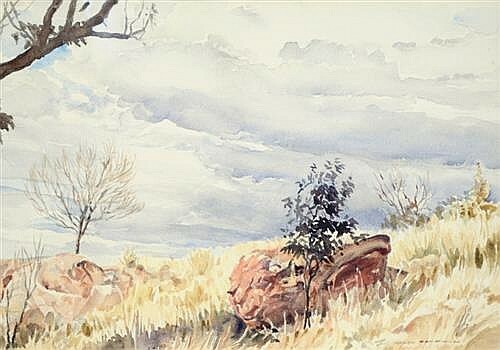 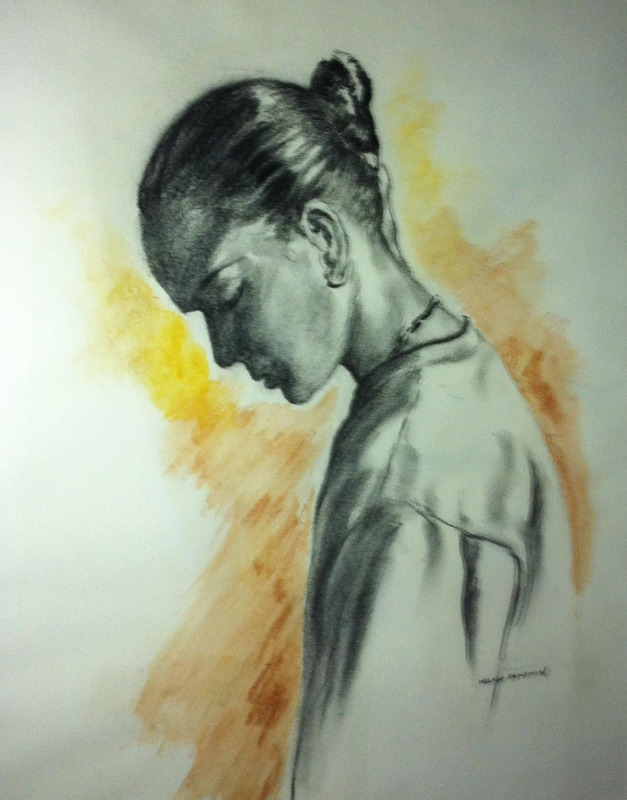 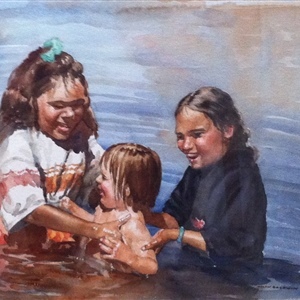 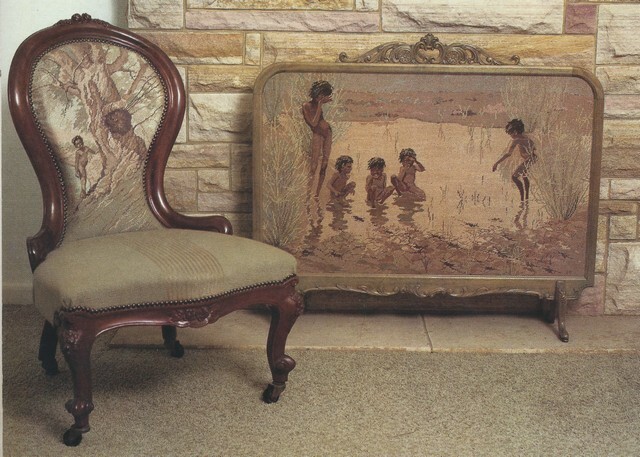 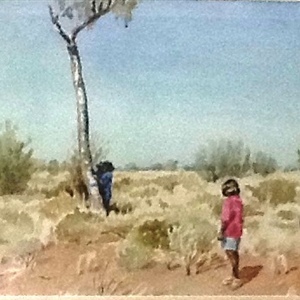 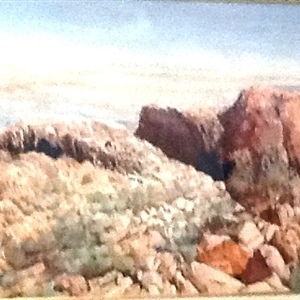 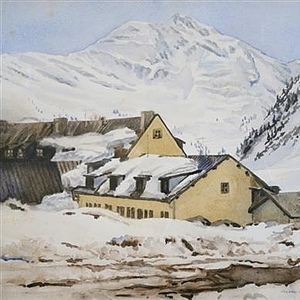 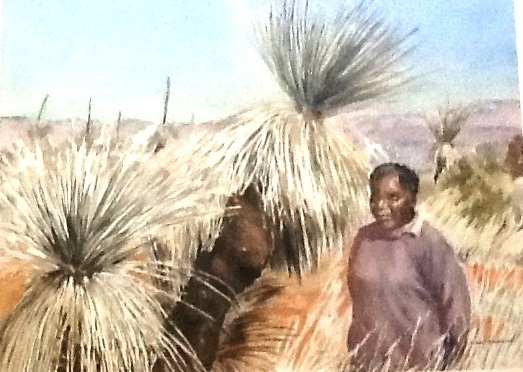 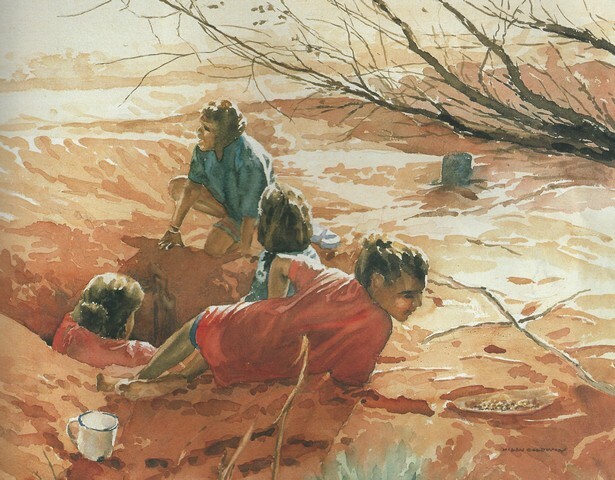 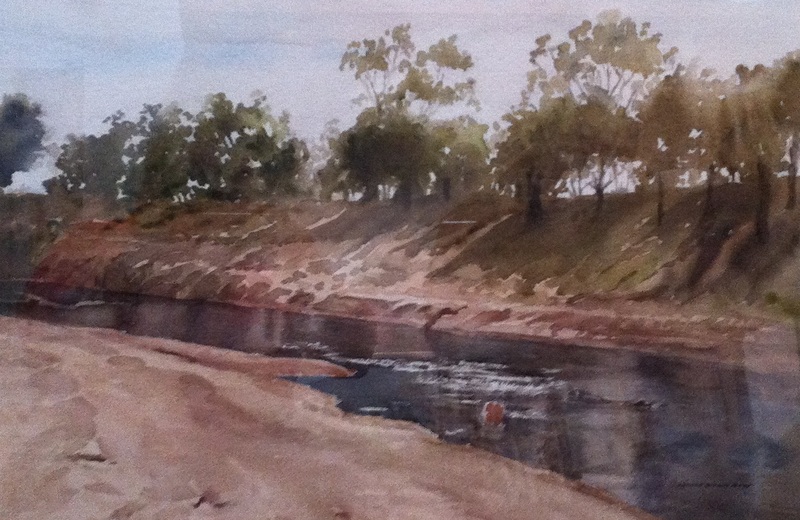 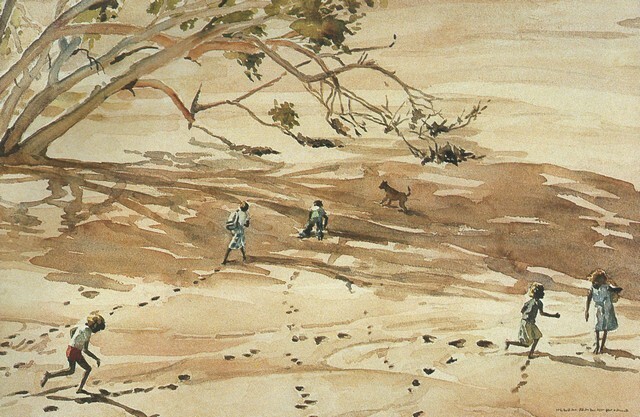 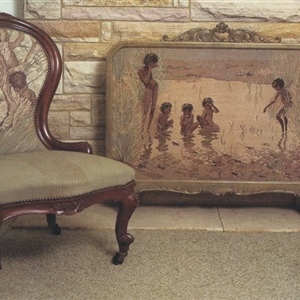 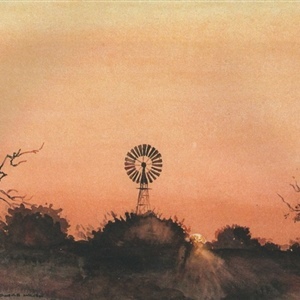 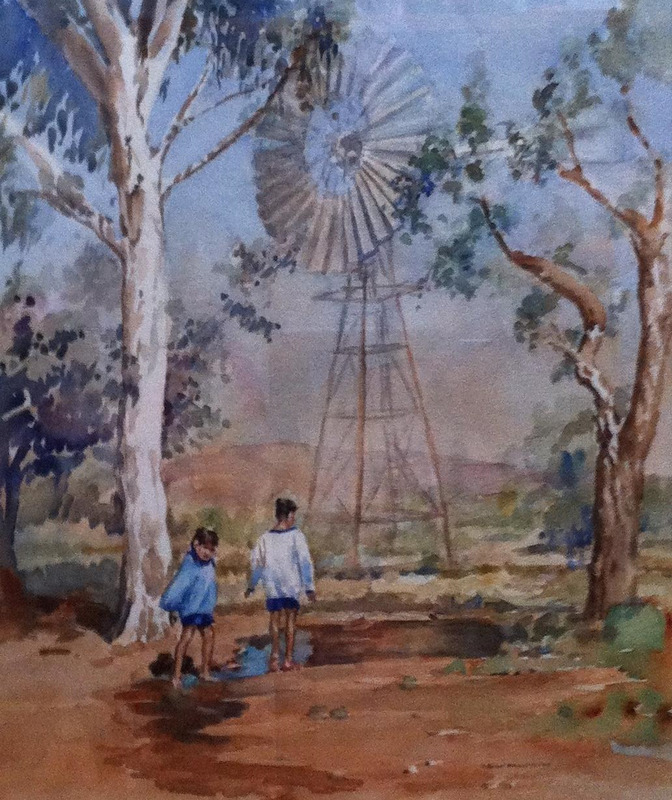 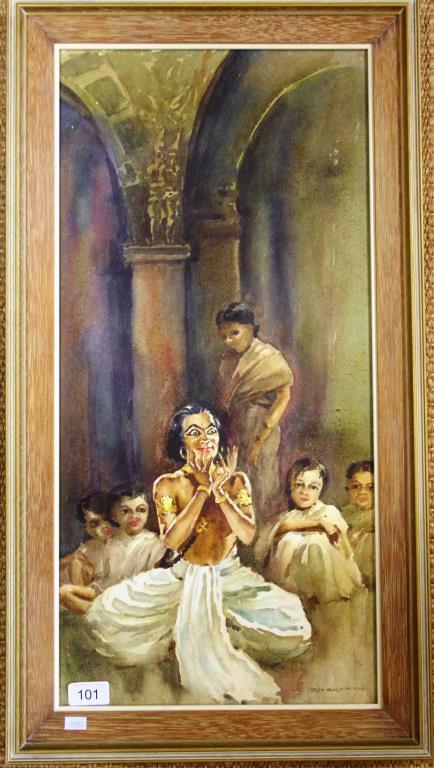 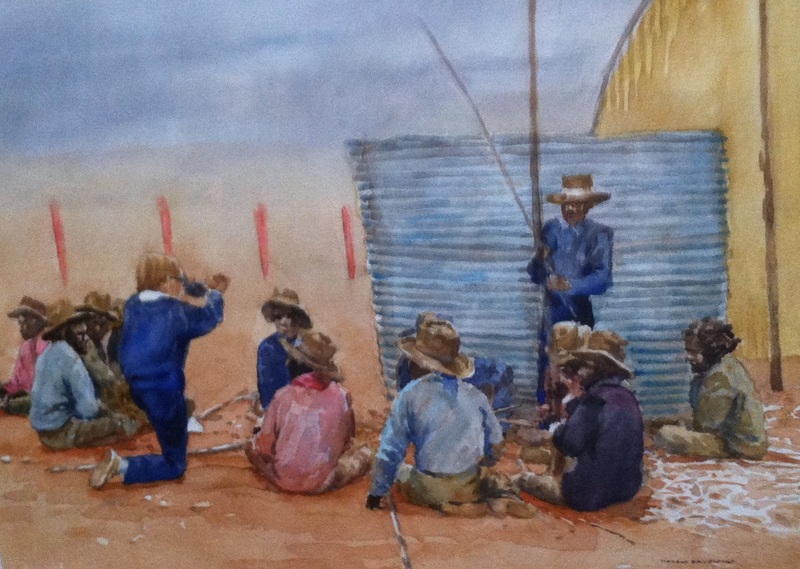 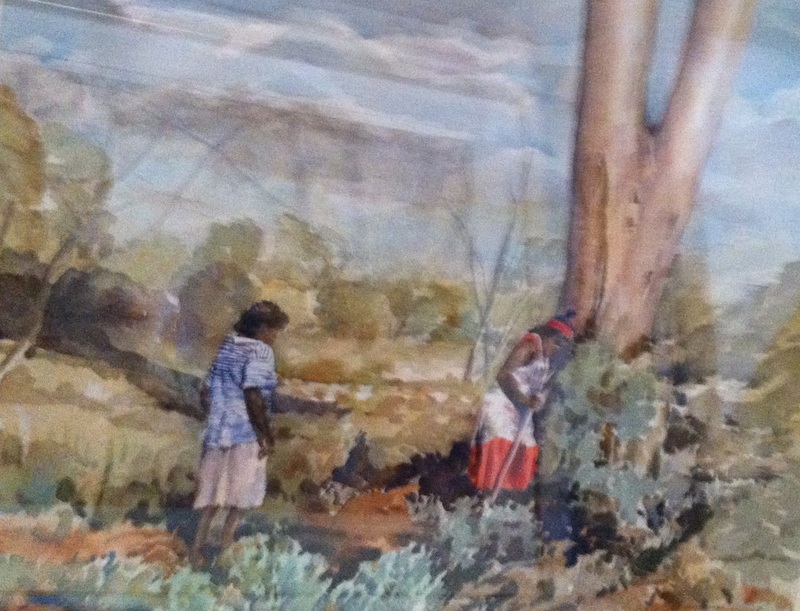 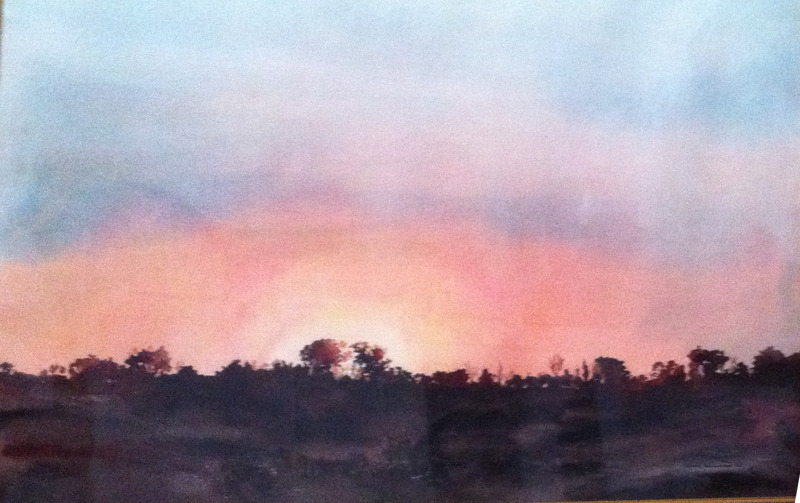 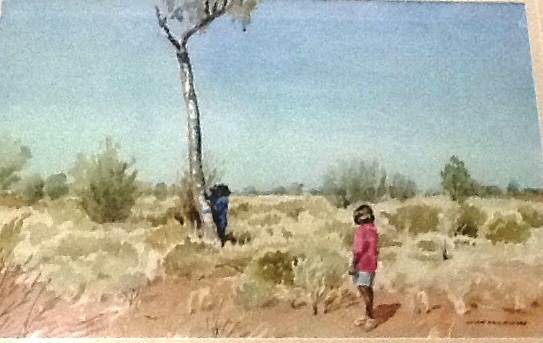 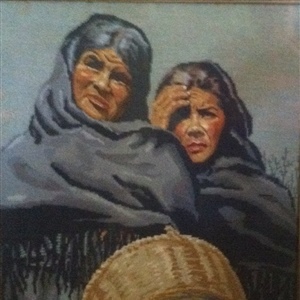 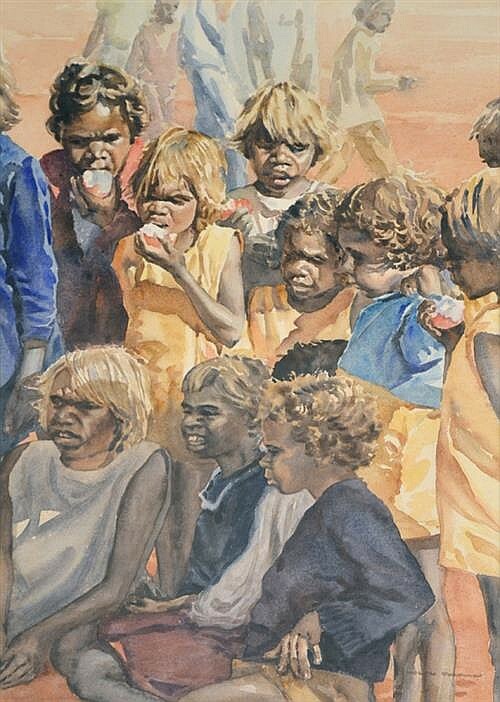 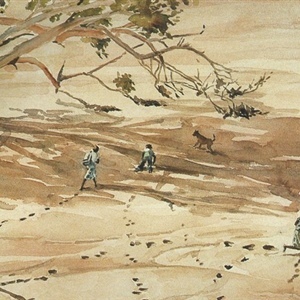 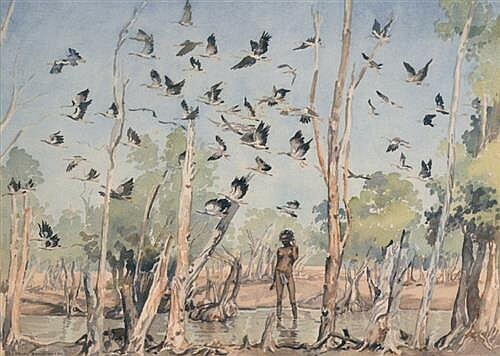 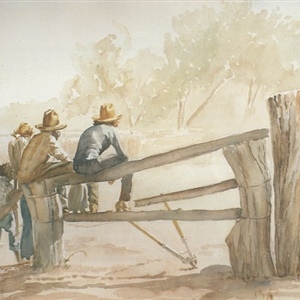 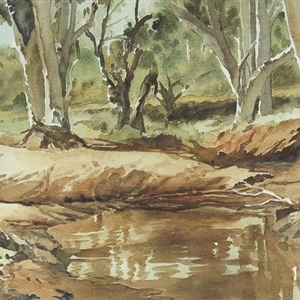 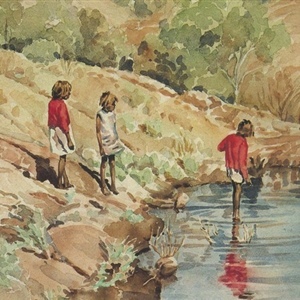 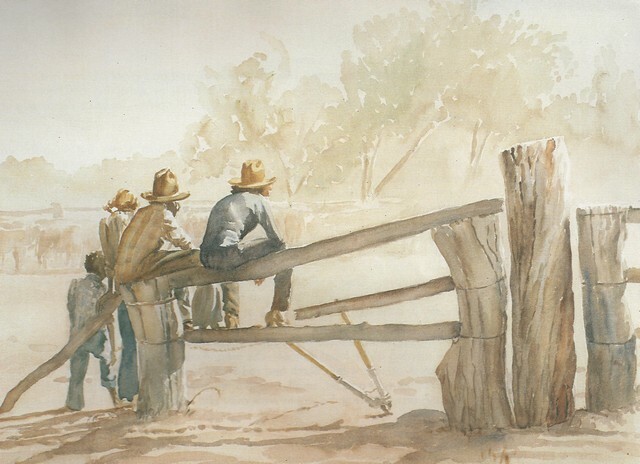 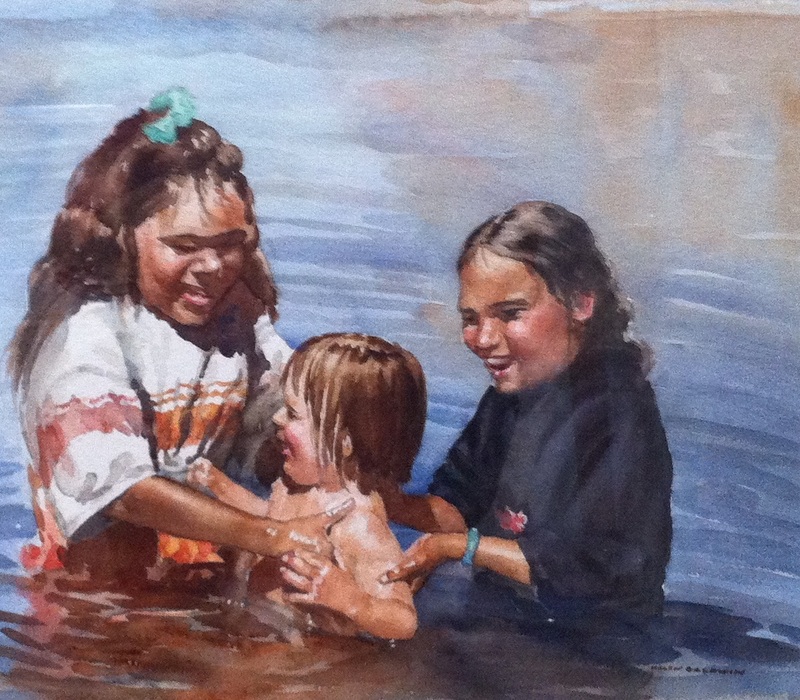 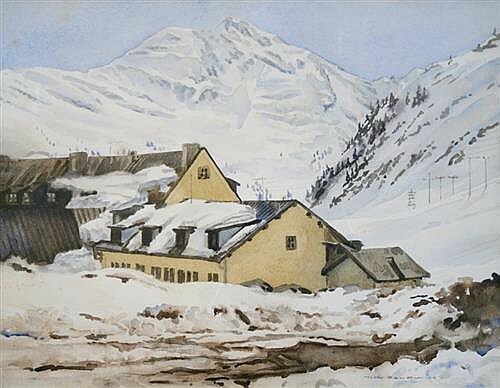 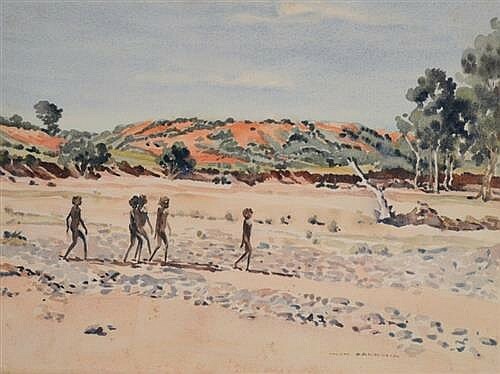 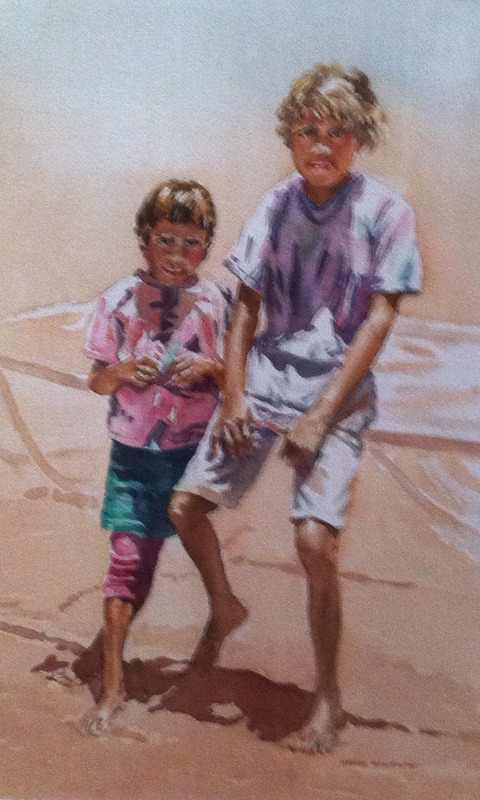 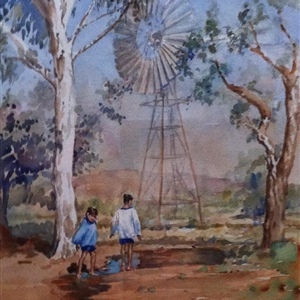 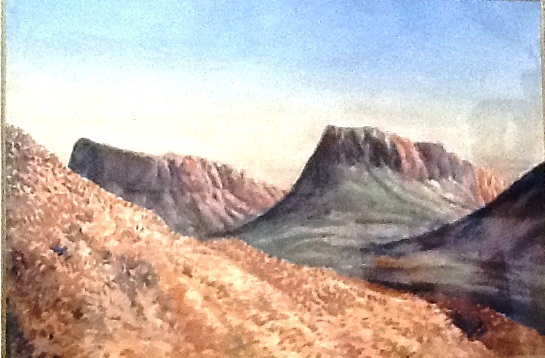 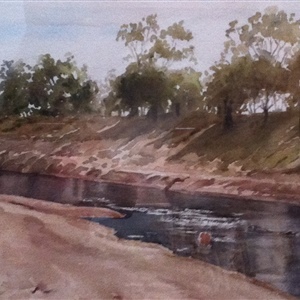 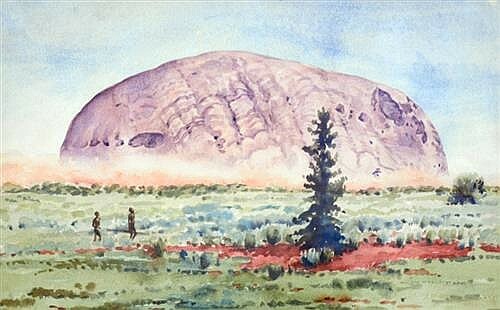 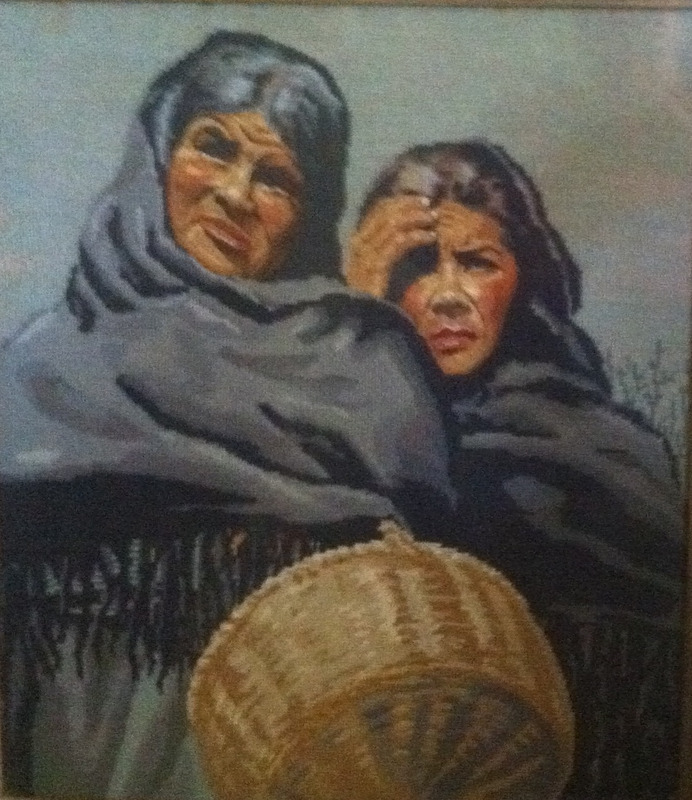 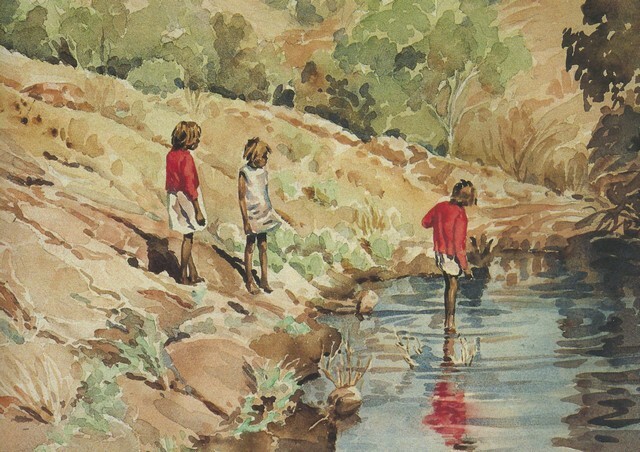 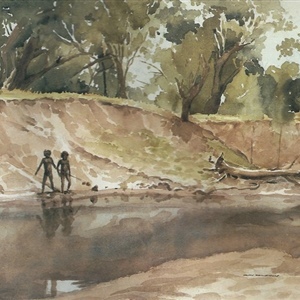 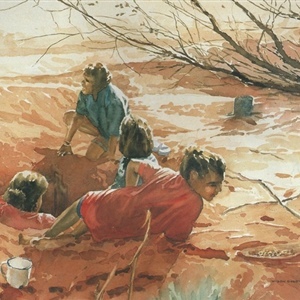 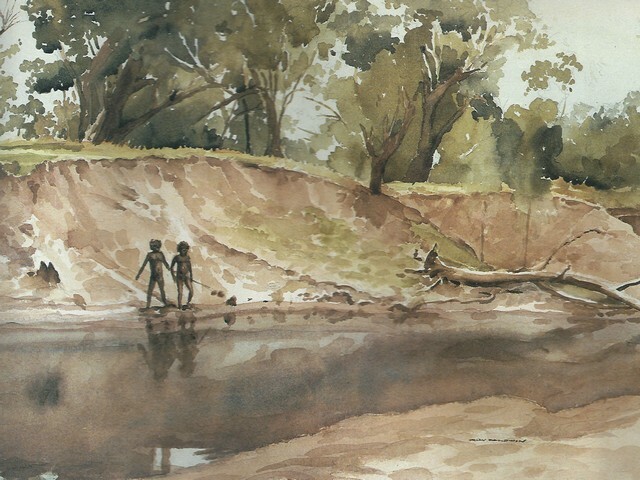 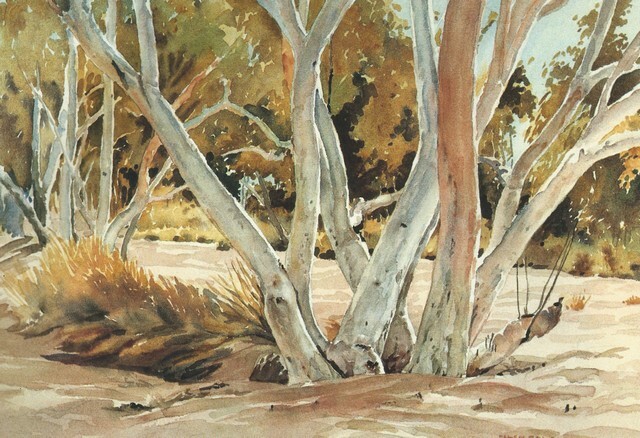 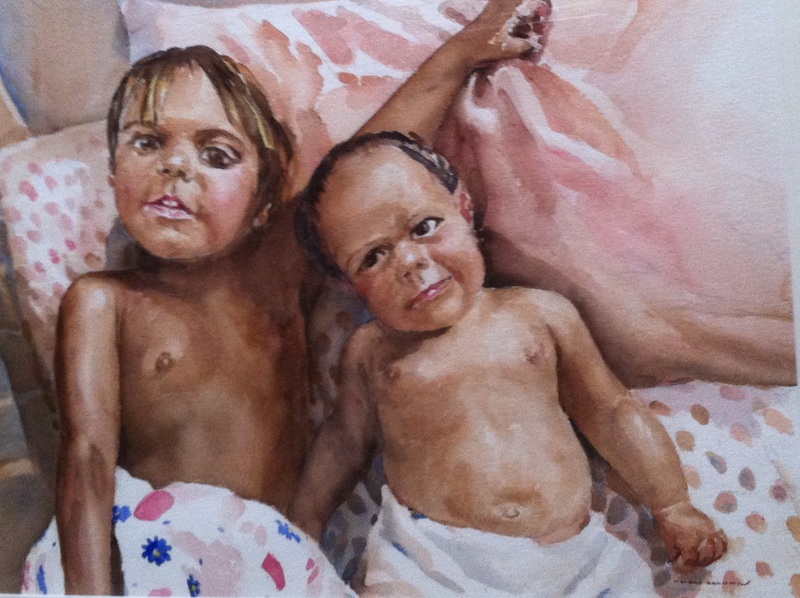 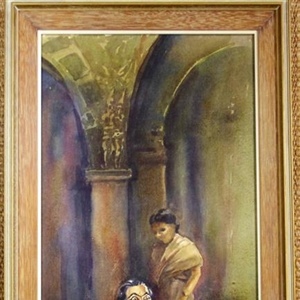 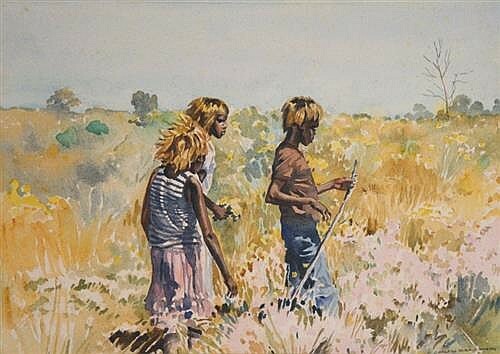 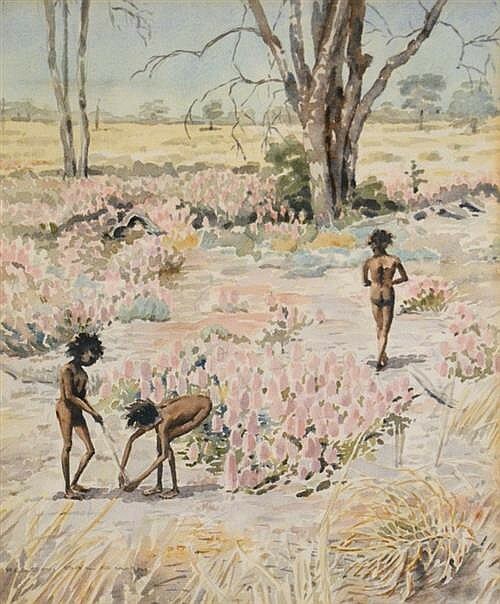 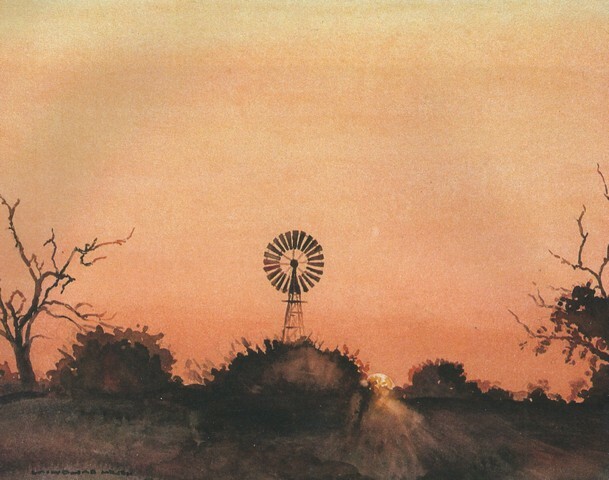 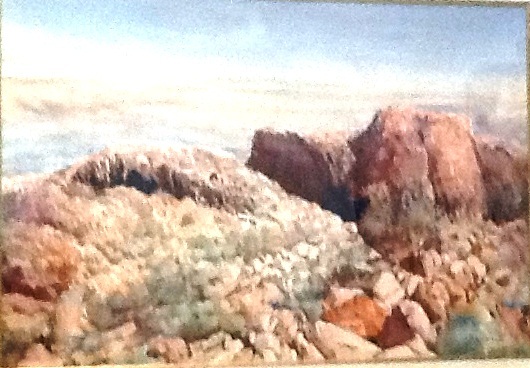 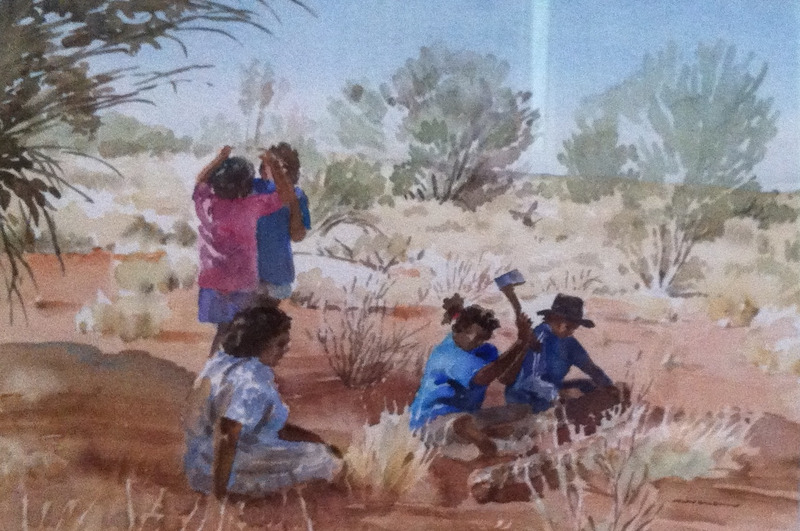 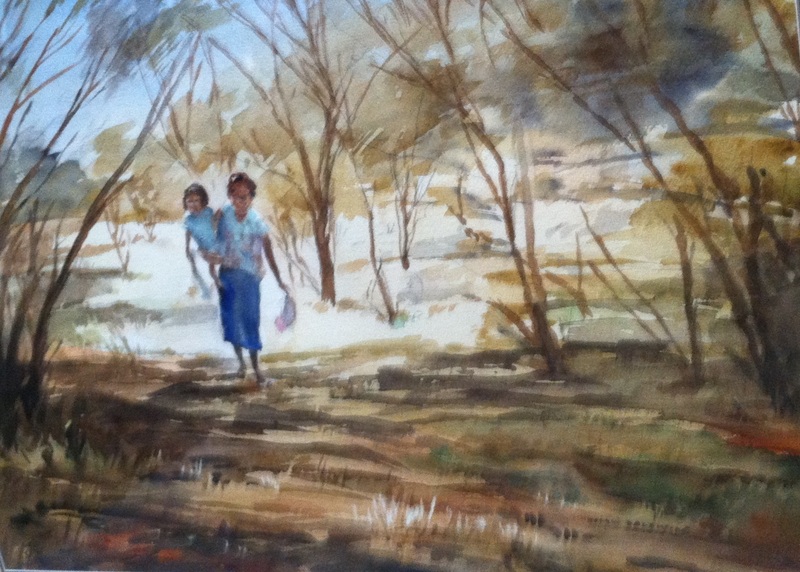 Then when her friends moved to Katherine she began to visit them and found other scenes to paint. 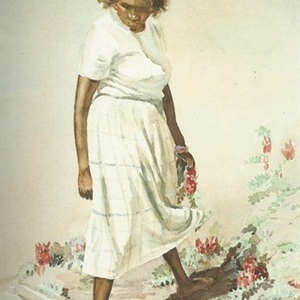 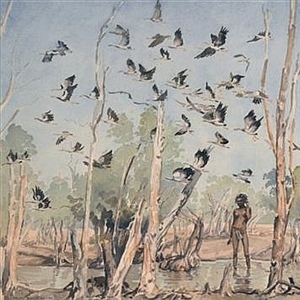 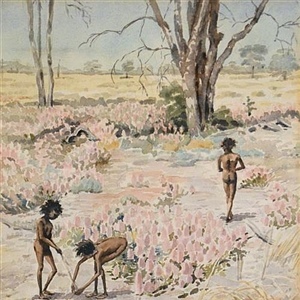 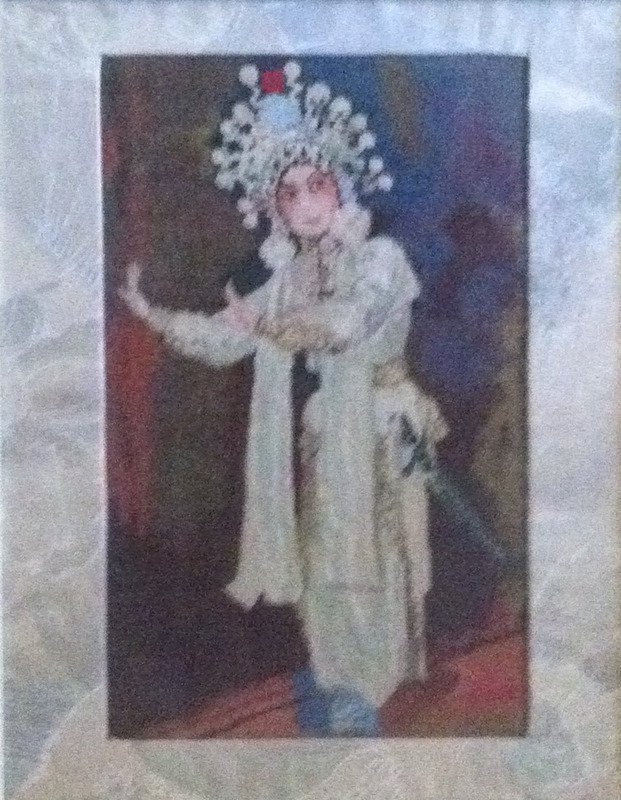 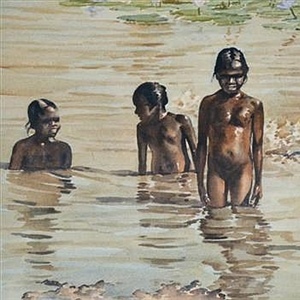 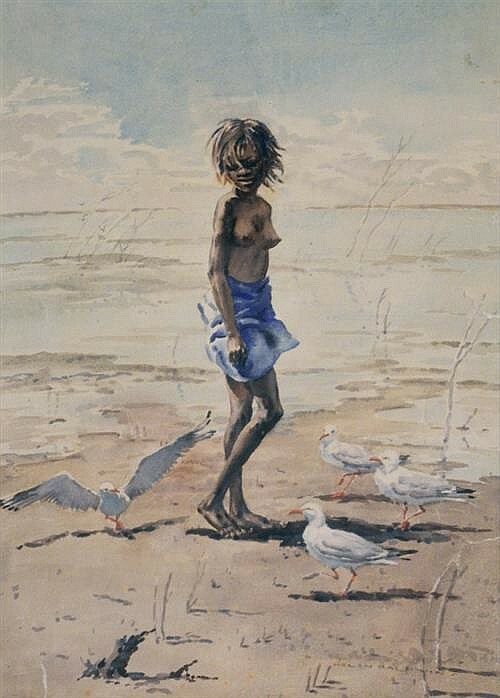 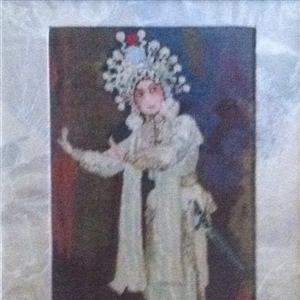 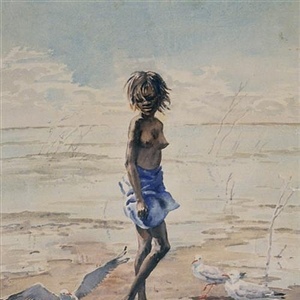 The very dark-skinned aboriginal girls wading through waterlilies in the lagoon; a man dancing in a headdress of white cockatoo feathers. 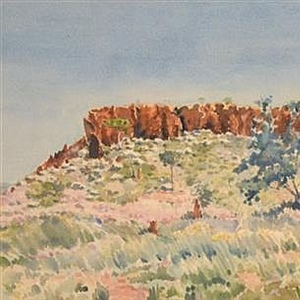 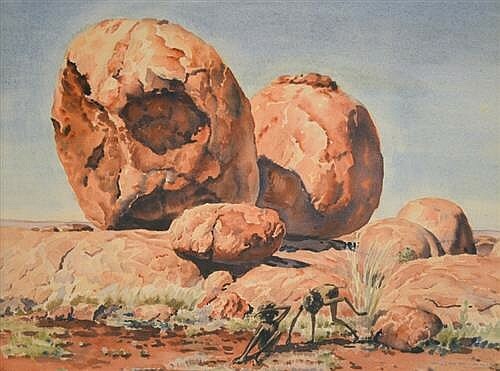 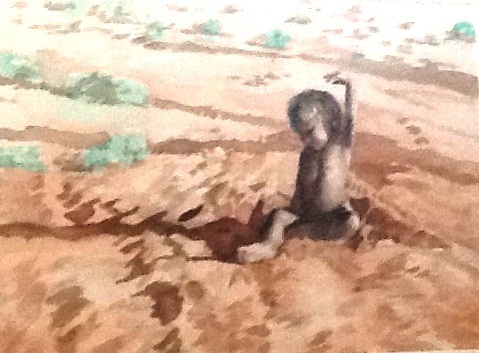 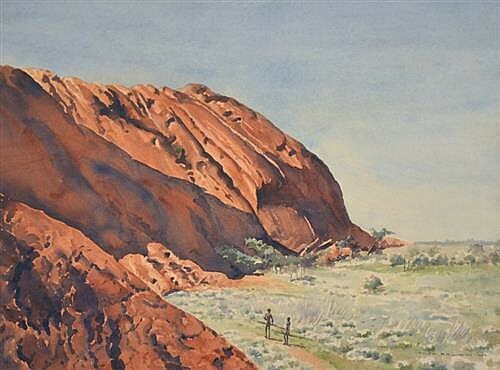 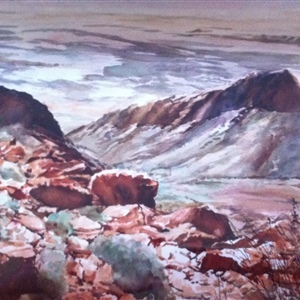 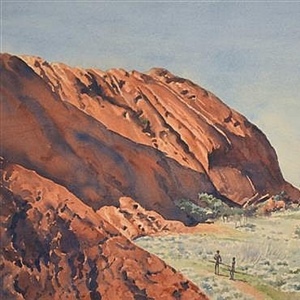 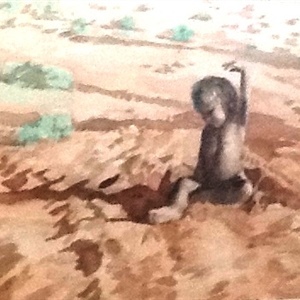 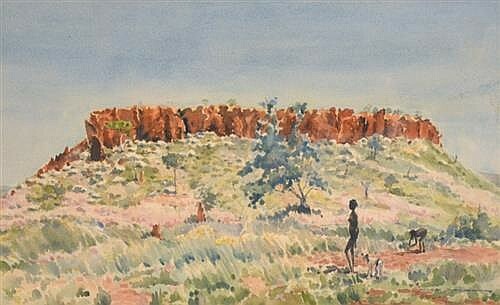 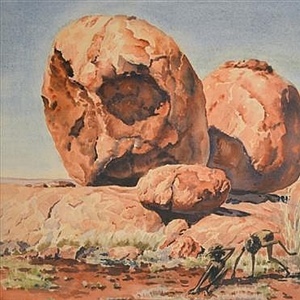 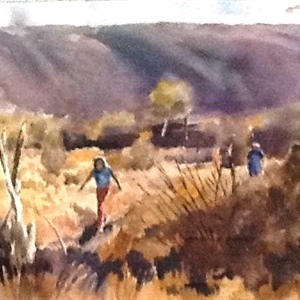 An opportunity to go to Papunya and Haasts Bluff brought more of the centre alive for the artist including the rock formations of the MacDonnell Ranges, a source of inspiration for a long time. 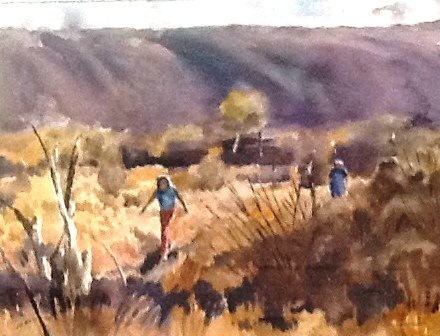 So many places to see and paint. 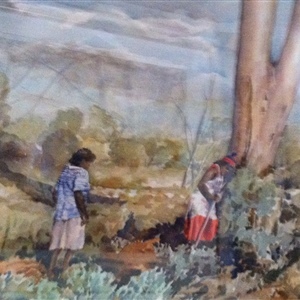 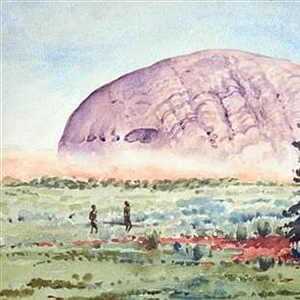 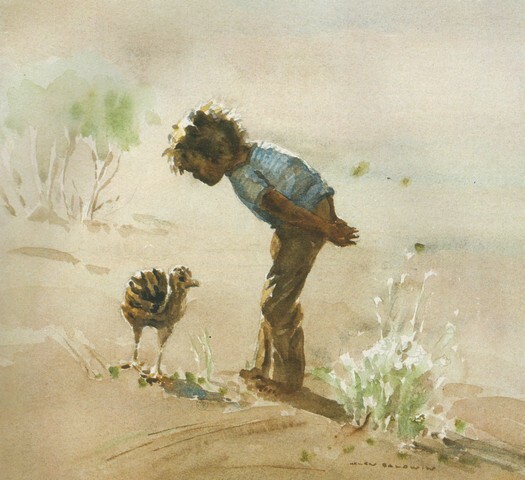 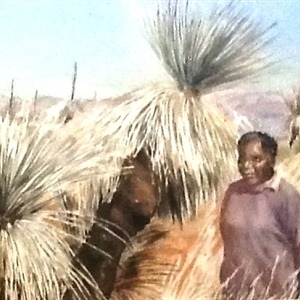 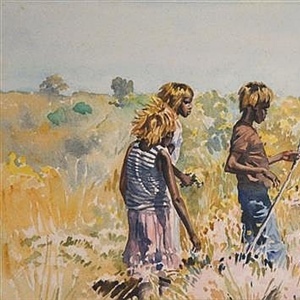 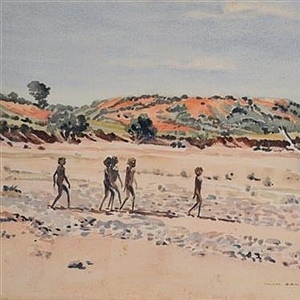 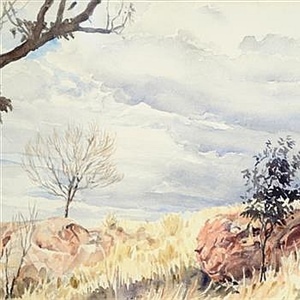 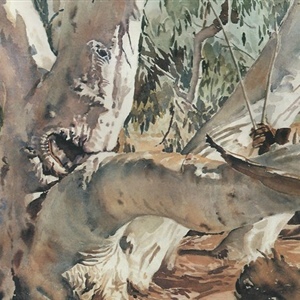 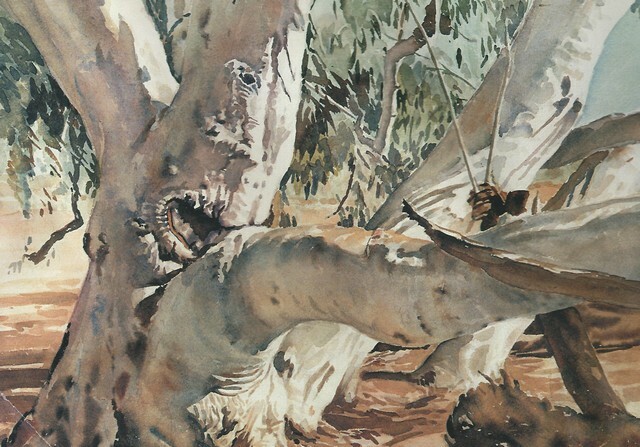 Over the forty years in which she has gone out eagerly season by season to the centre of Australia, Helen Baldwin has not only recorded the changes in a fragile environment, but sadly she has shown in her work the passing of the rare and mystic culture of the aboriginal people. 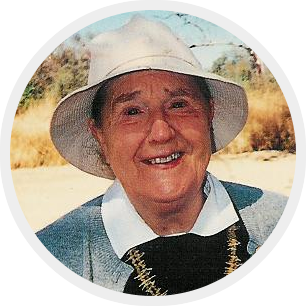 We do hope you will enjoy the website as much as Kate's On Web and Ligante have enjoyed putting it together.